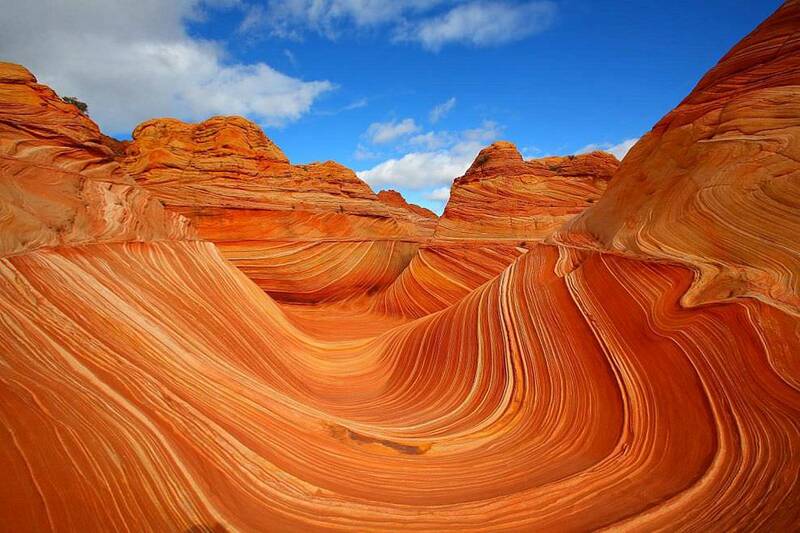 The Wave is a sandstone rock formation in the Paria Canyon-Vermilion Cliffs Wilderness of Arizona, formed over millions of years of wind erosion in the Navajo Sandstone. Besides looking like something from another planet, it also makes for one hell of a photo-op. 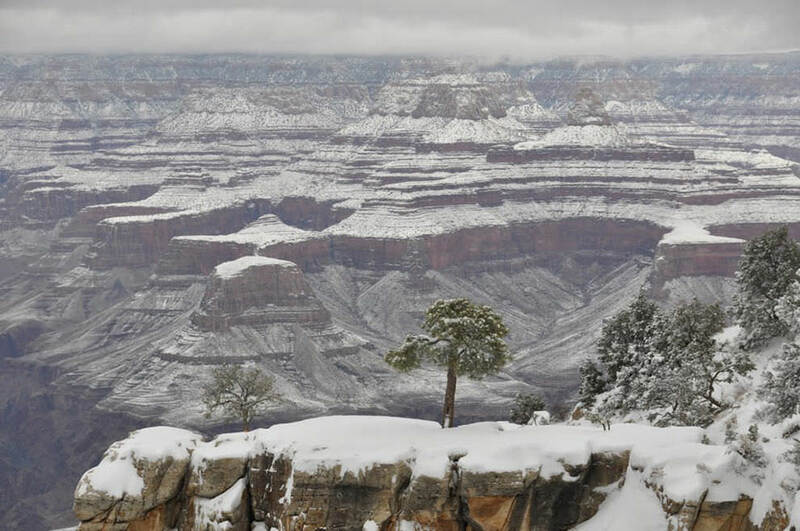 One of America’s most recognizable natural wonders, there is only one word describe the Grand Canyon: breathtaking. 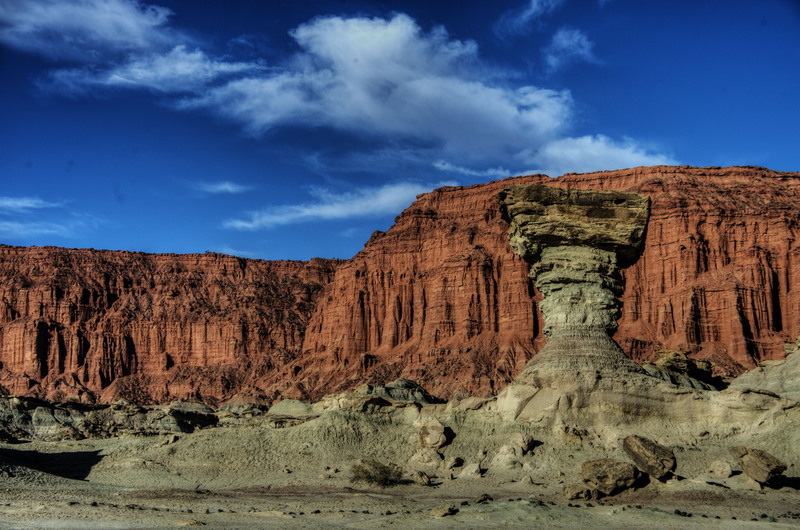 A trek through this 227 mile long canyon isn’t unlike entering another, ancient world. 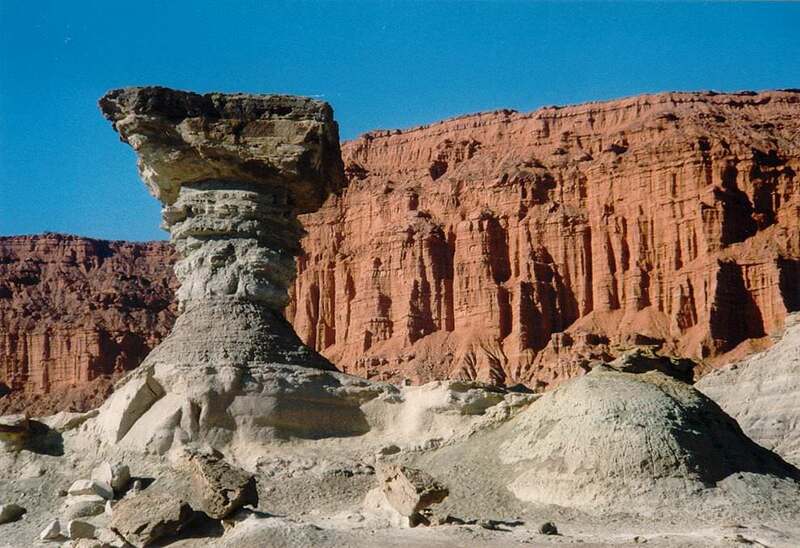 Try to visit it in winter, when a thin blanket of snow folds over the deep cliffs and valleys and makes the surreal landscape all the more beautiful. 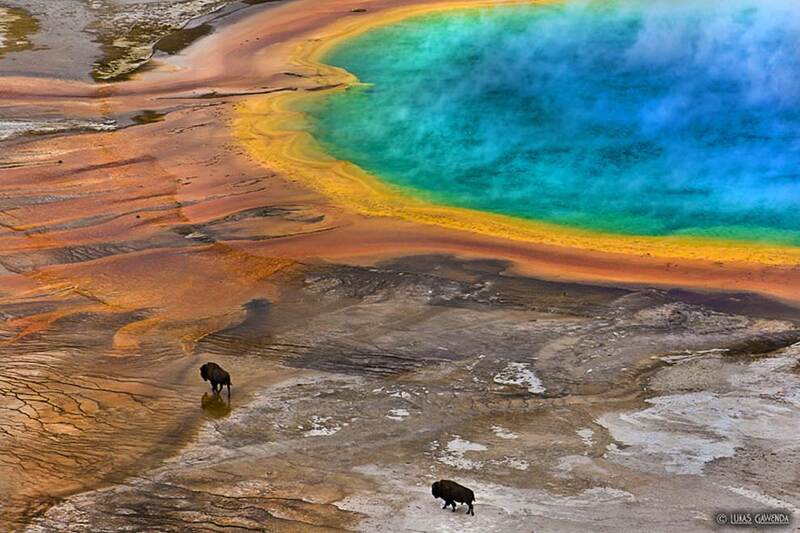 If the Yellowstone National Park is one of America’s greatest natural treasures, then the Grand Prismatic Lake is the crowning jewel in that treasure. 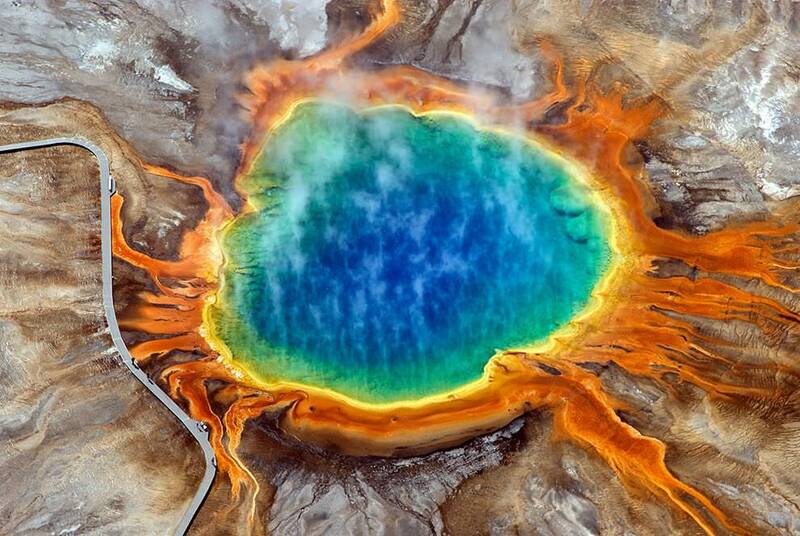 This hot spring gets its unique colors from the presence of pigmented bacteria that grow around the mineral rich waters. 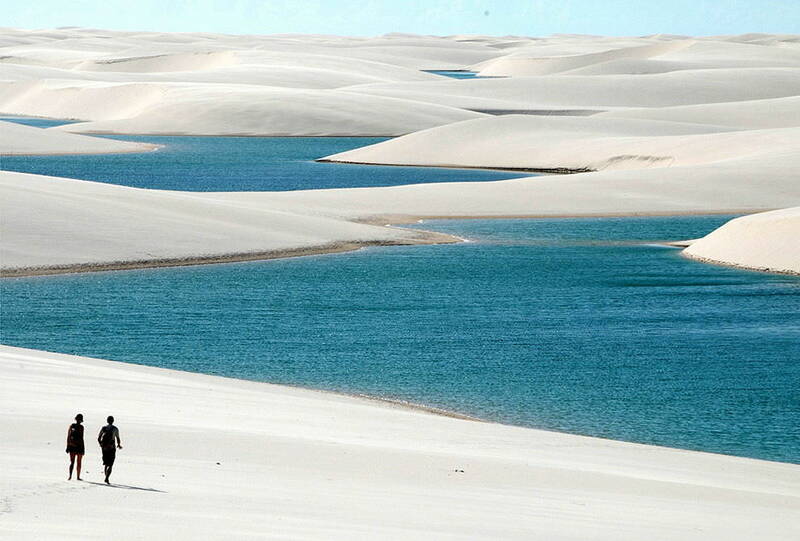 The waters are hot, but visitors – human and animal – can walk around the edges. 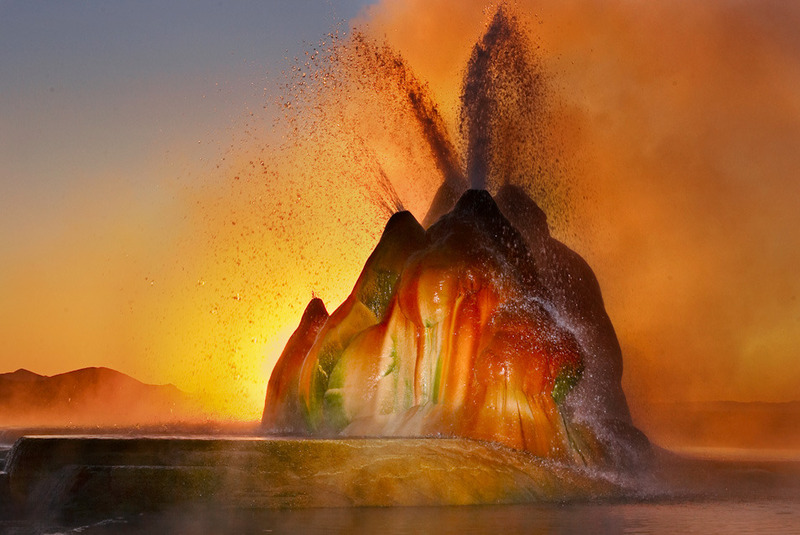 What looks like a digital-artist gone wild is actually a man-made geyser inside a private ranch in Nevada, USA. The geyser was made in the 1960s when an improperly sealed oil well started sprouting up dissolved minerals around the well’s exterior. 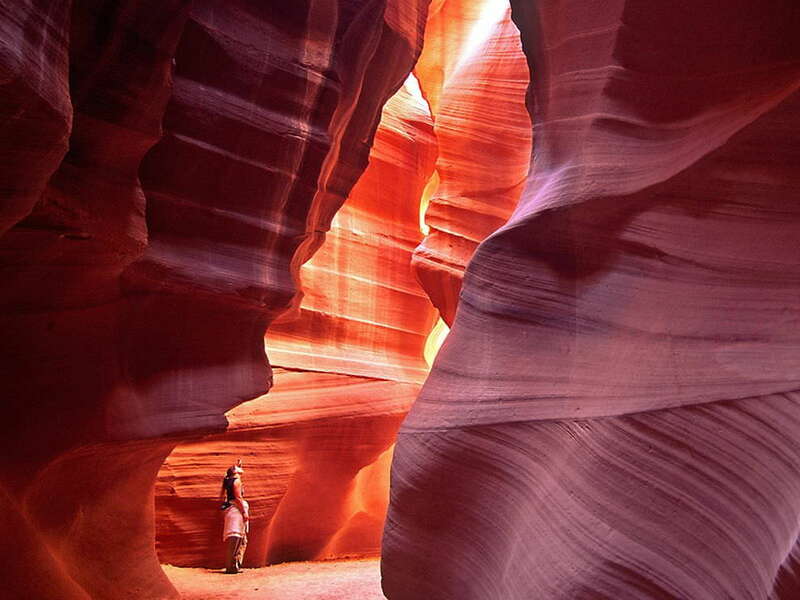 The Navajos called this slot canyon “the place where water runs through rocks”. 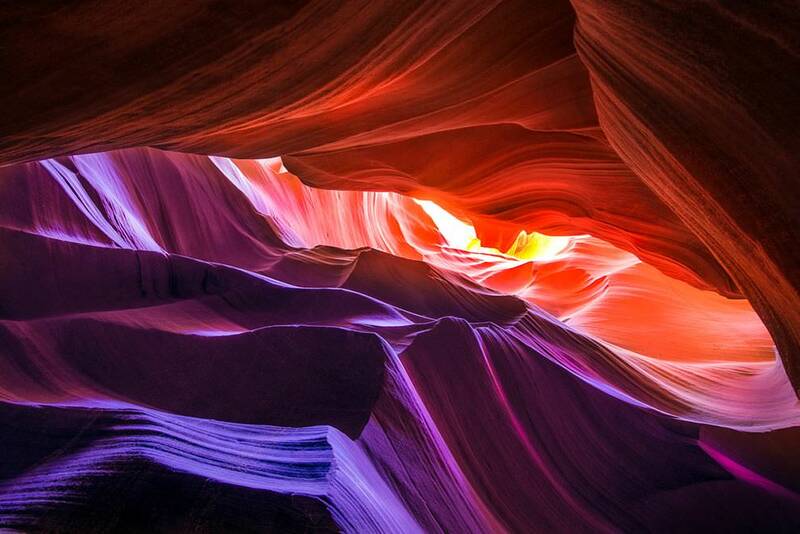 Faint beams of light shine down on the canyon floor, bathing the walls in hues of pink, brown and violet. The effect is haunting and surreal. No, this isn’t a screencap of Mordor from LoTR. The Horsetail fall is actually a seasonal waterfall in the Yosemite. The sun shining down upon the falls at certain times makes it glow yellow-red, like a torrent of fire falling to the earth. 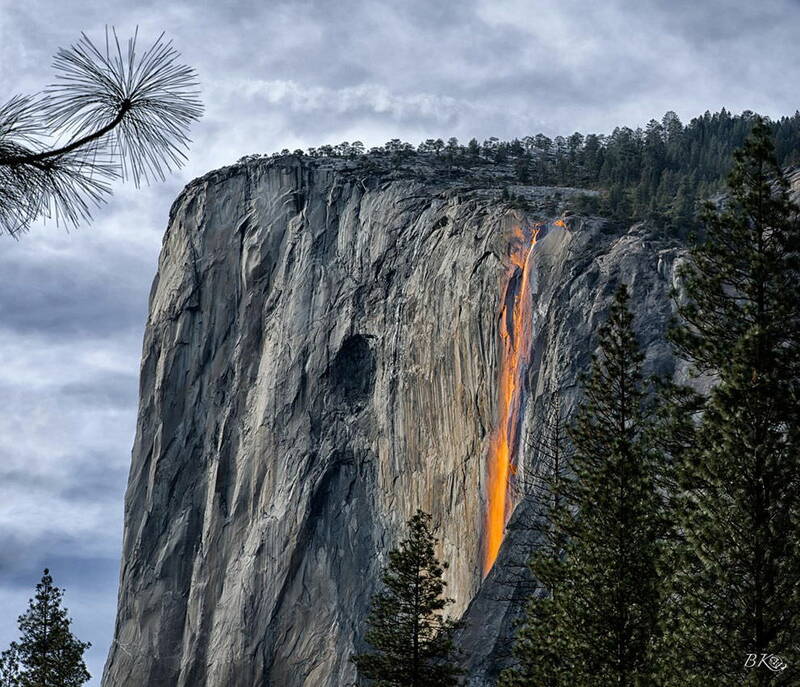 It is often called a ‘firefall’ based on an actual man-made phenomenon in the Yosemite until a few decades ago. Still makes for one heck of a photo-op though. 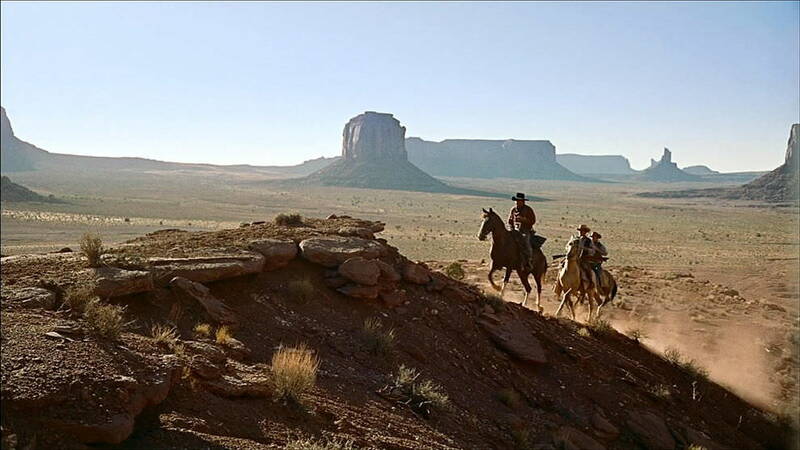 How many westerns have you seen with a man on a horse riding into the wilderness with these stone pillars rising in the background? The Monument Valley has been a Hollywood staple for years, and it is easy to see why: the rock formations cropping up from the dry, flat land seems like something straight from a surrealist Dali painting. 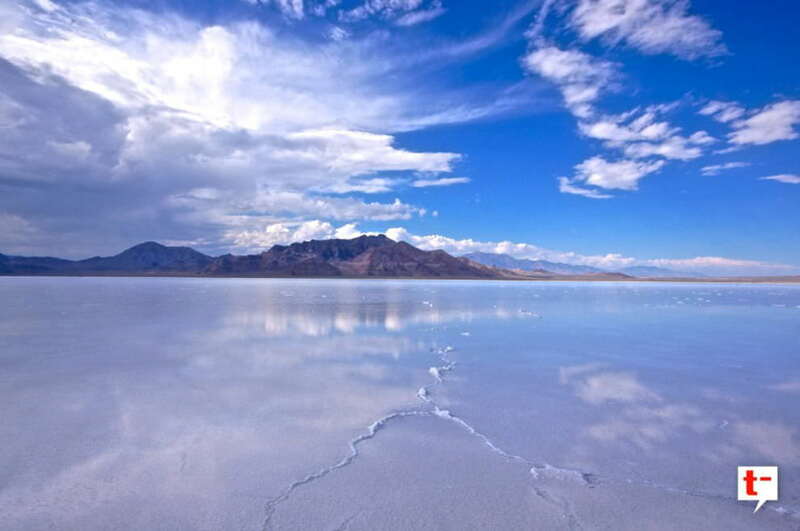 The Bonneville Salt Flats is one of the flattest landforms on earth. It is dry, dusty, and flatter than a racetrack. Which is probably why car racers like to drag their souped up vehicles to these flatlands and head out for a spin – something we highly recommend. Just don’t go in the peak summer – the 120F temperatures will turn your car to toast! It’s even better with a bit of rain when the entire region gets covered in a thin film of water, turning it into a giant mirror. 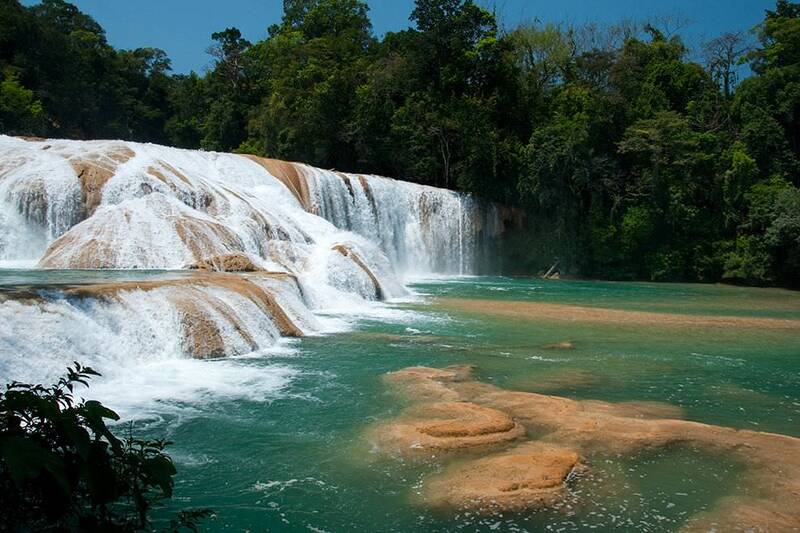 This eighty foot waterfall falls right onto a beach, which opens out to the great wide blue of the Pacific. 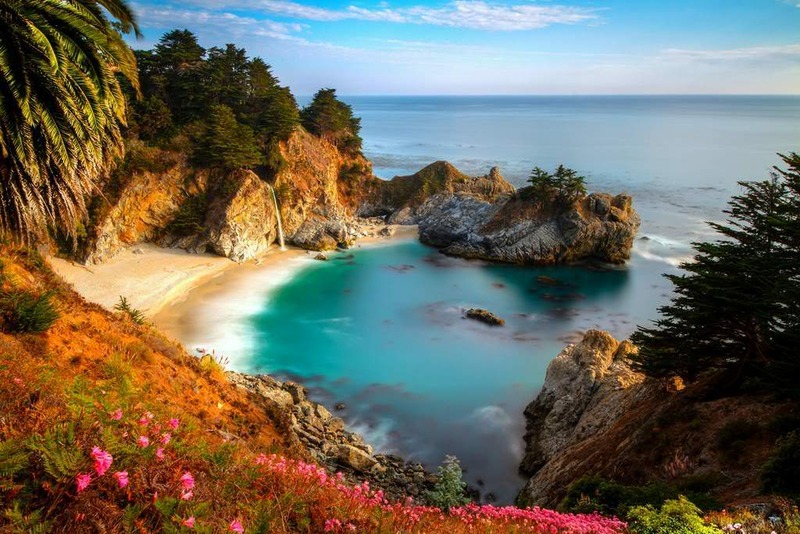 Throw in some wildflower covered cliffs and white sands of the beach, and you have a landscape that appears just too beautiful to be real. Sometimes, trash can be beautiful. 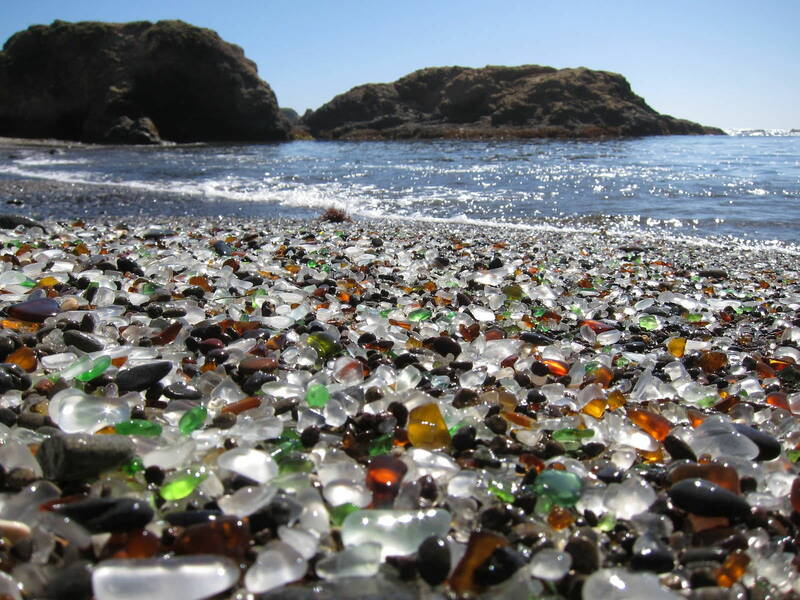 Take the Glass Beach in Fort Bragg, California, for instance. 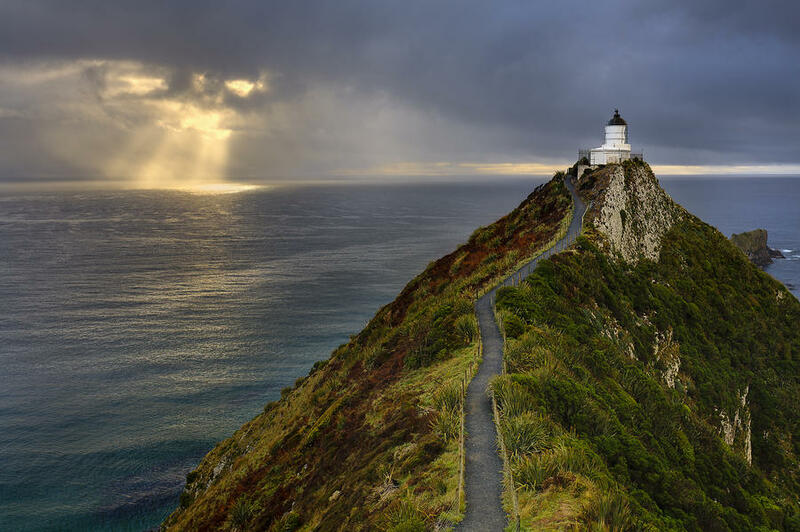 In the early part of the 20th century, residents of this small town threw everything from household garbage to appliances over the cliffs and onto the beach (the 1900s weren’t a really enlightened time). Over the next several decades, the waves of the Pacific washed away everything but the glass and the pottery from this trash. 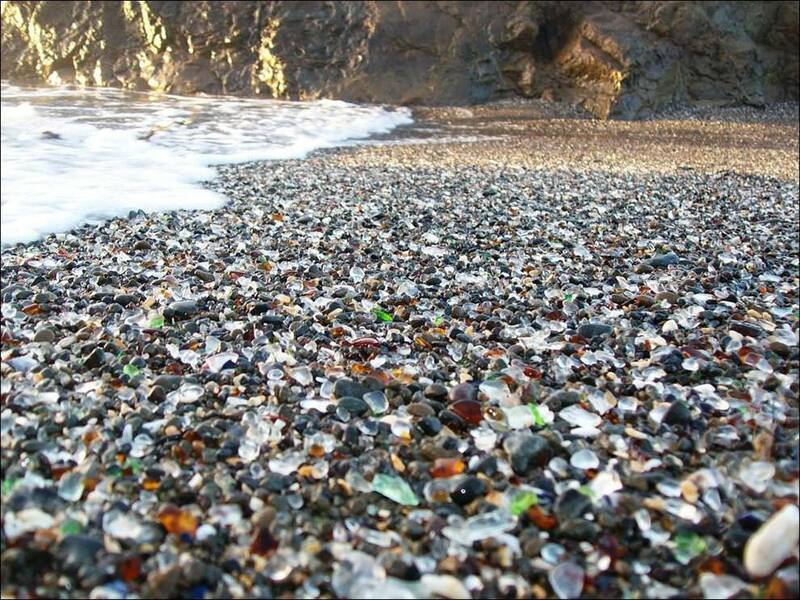 The glass smoothed out over years of erosion, and the result is a beach literally littered with colorful glass. Like a scene straight out of a Lewis Carroll book. 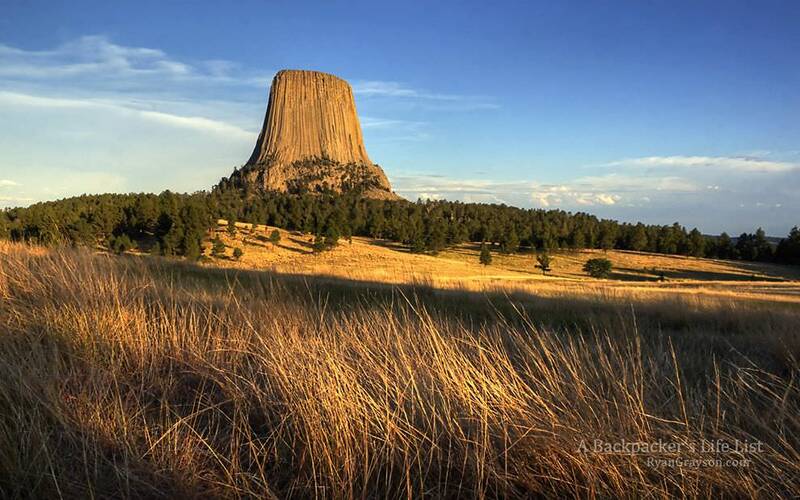 Picture this: you are riding a horse through the vast plains of Wyoming when you come across a sheer faced rock rising a thousand feet of the ground. The rock is the color of ash, and in the fading sunlight, it seems to glow a fiery red, like the breath of the Devil himself. 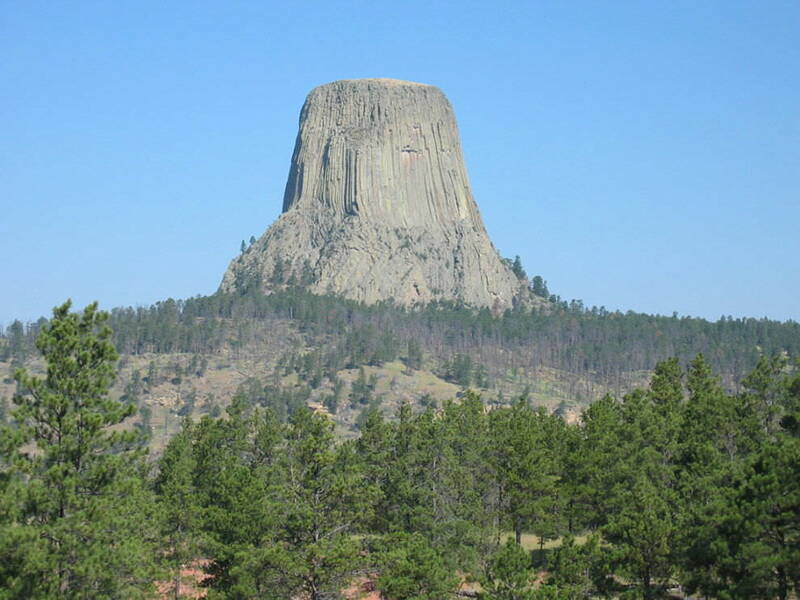 You can now imagine how this rock formation in the Black Hills came to be called the “Devil’s Tower”. It wouldn’t be an exaggeration to say that this would be perfectly at place in the Lord of the Rings. 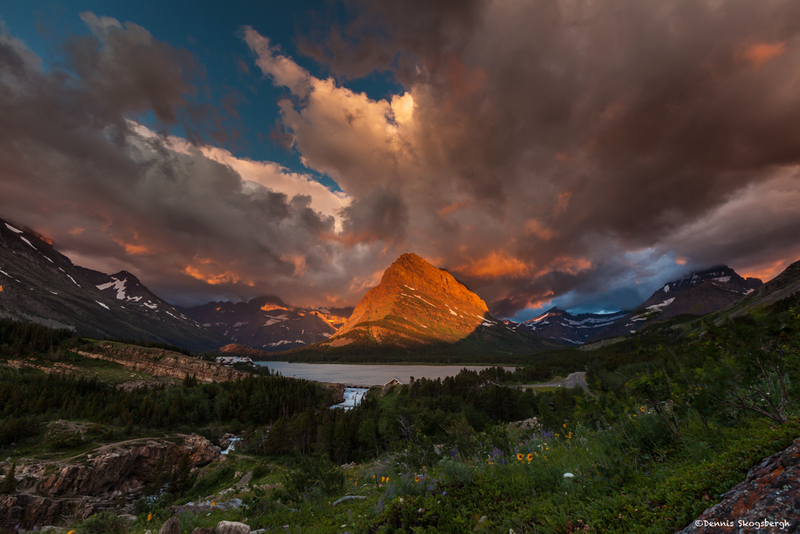 This mountain nestled deep within Glacier National Park is beautiful by itself, but what makes it truly surreal is the sun shining off its surface and the reflection bouncing off a nearby lake. Imagine a desert, but with sand as white as the first snowfall in Montana. 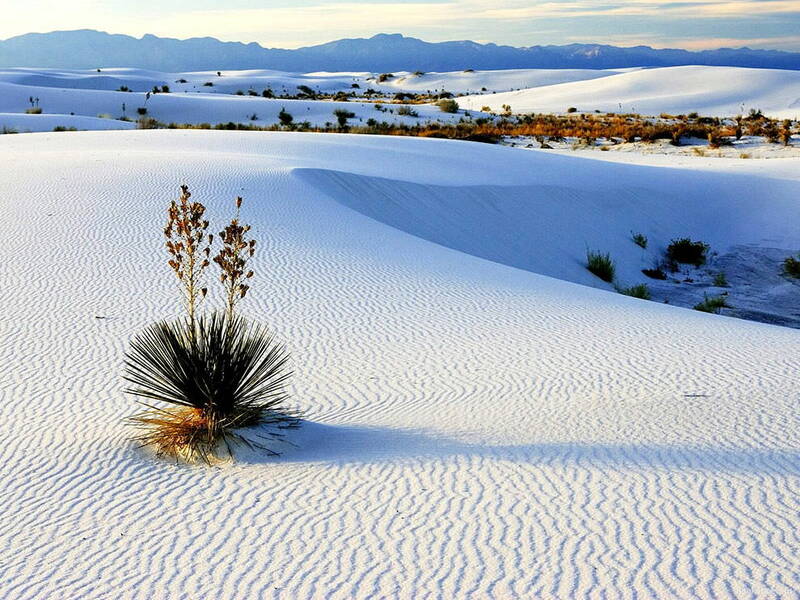 That’s the White Sands National Monument in New Mexico. Stunning, by any measure. 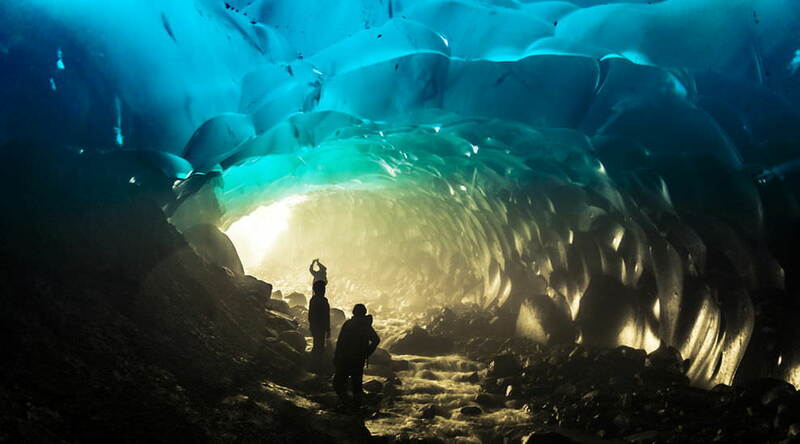 The Mendenhall Ice Caves are nestled deep within the Mendenhall Glacier near the city of Juneau, Alaska. 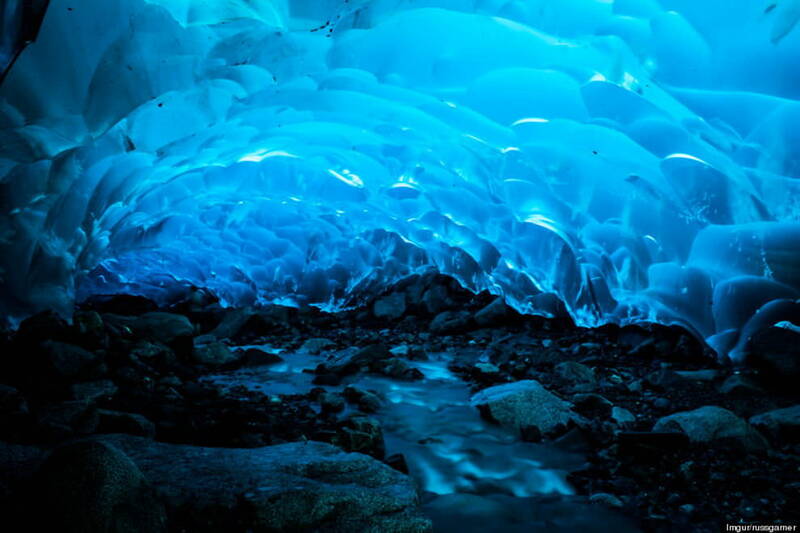 The light from the cave entrance bounces off the ice and bathes it in a beautiful blue efflorescence. Beautiful. 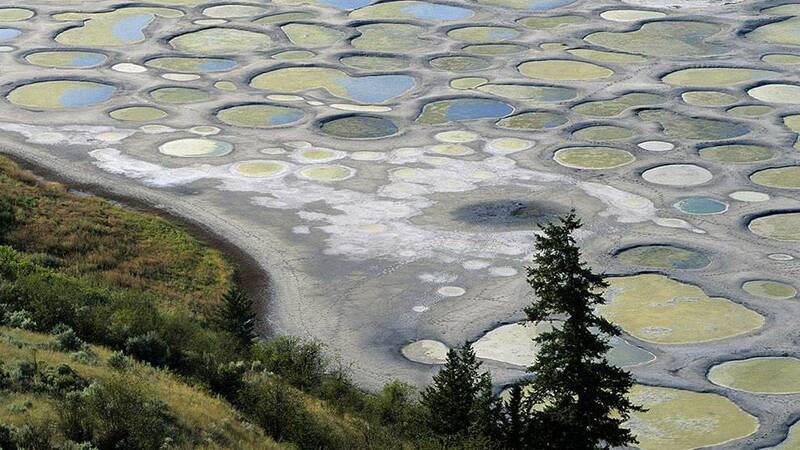 The Spotted Lake is an alkali lake in British Columbia. 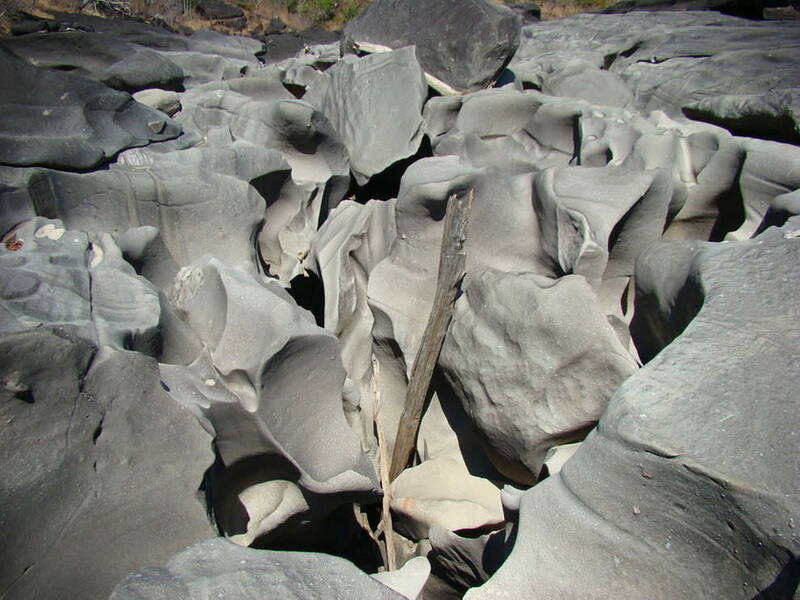 Every year in summer, the water evaporates, leaving behind mineral deposits. 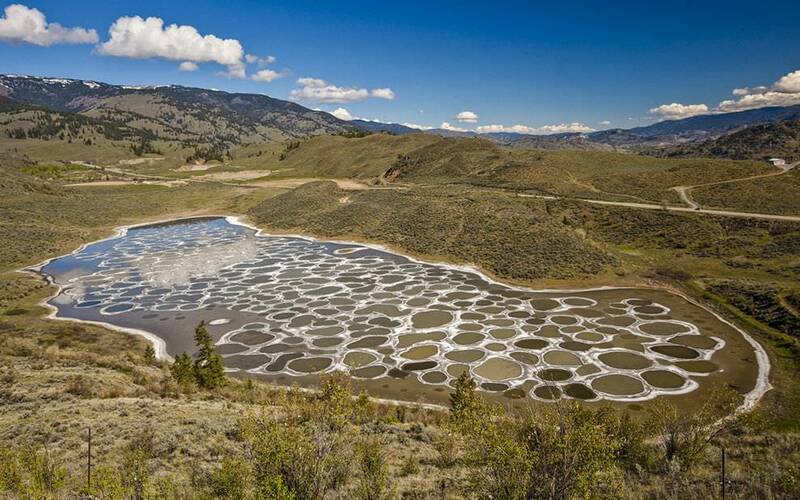 The mineral deposits lead to the creation of large “spots” on the lake, often with different colors depending on the mineral composition of a particular spot. The effect is breathtaking. 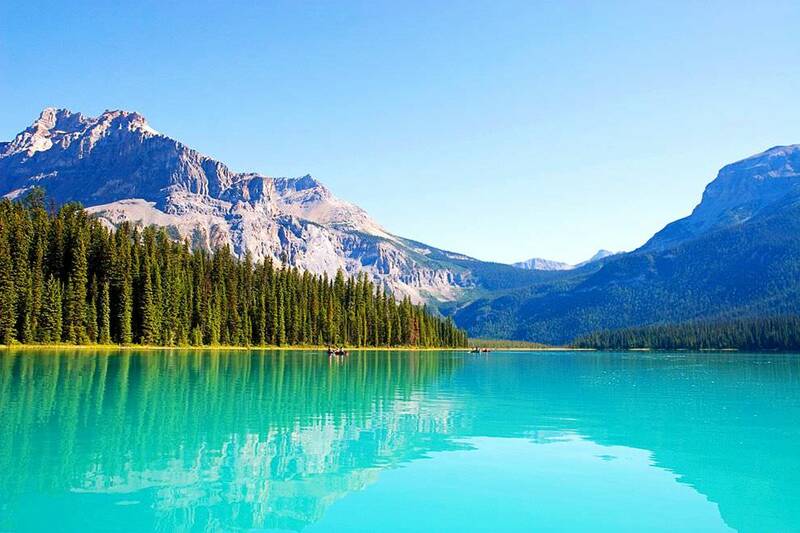 Pretty much all of Canada is beautiful (even you, Toronto), but if we had to pick one place for a spot on this list, it would have to be the Emerald Lake in Yoho National Park, British Columbia. 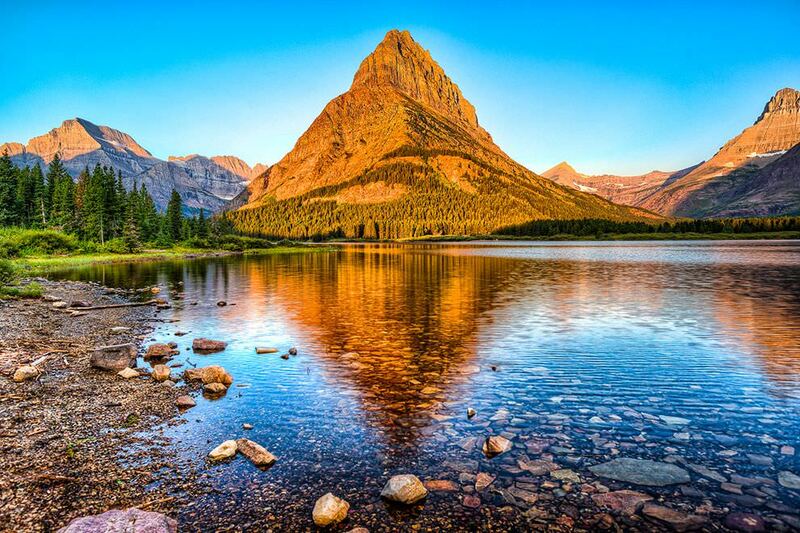 The stunning emerald green waters surrounded by mountains of the President Range is just too beautiful to be real. 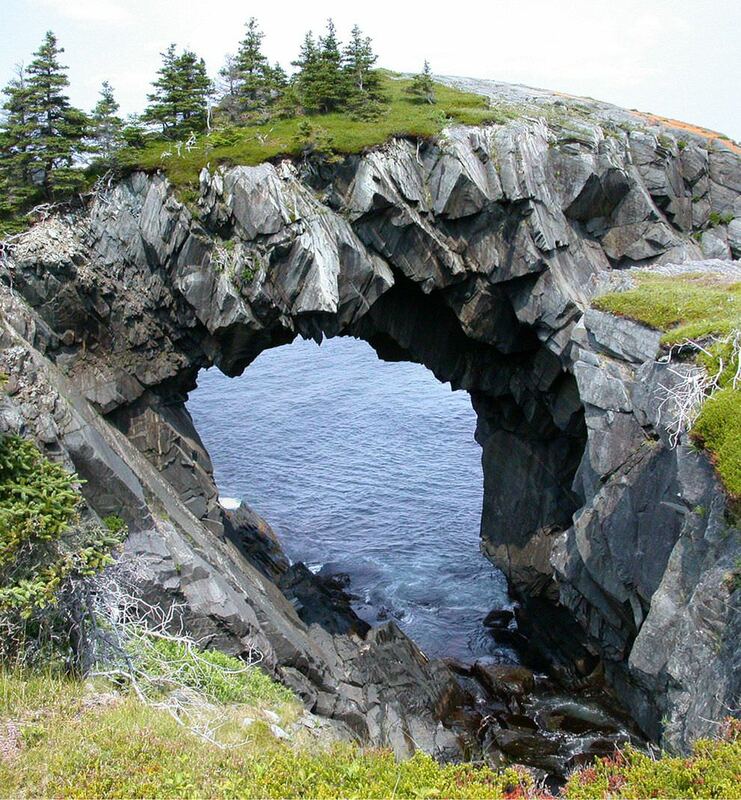 Naturally occurring archs are very rare, which makes this gravity defying landform all the more special. Take a look – isn’t this the perfect place for your next profile picture? 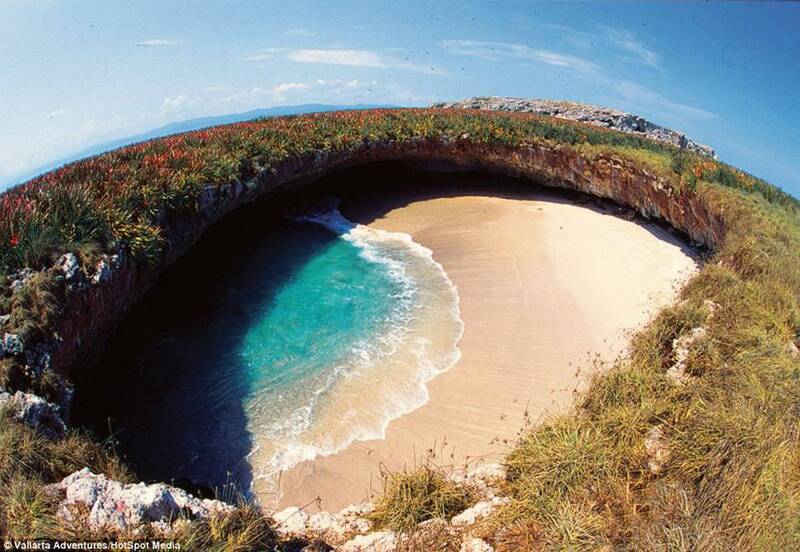 In the early 1900s, the Mexican government used the Marieta Islands for target practice, dropping bomb after bomb on its rugged cliffs. One of these bombs tore through the cliffs, revealing a beach hidden behind cliffs and thick forests. 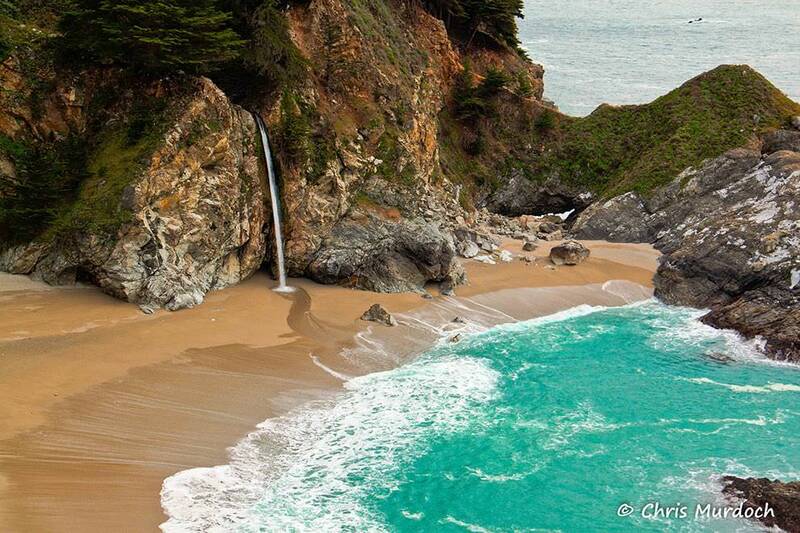 This beach lay undiscovered for years until tourists in the 1970s chanced upon it. 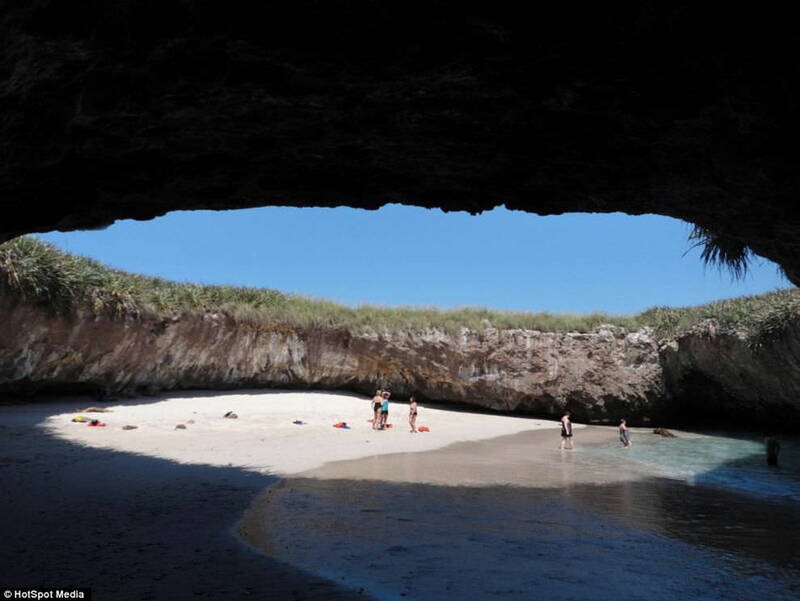 Today, the hidden beach is a major tourist destination, though the remote nature of the beach means its relatively unspoiled. 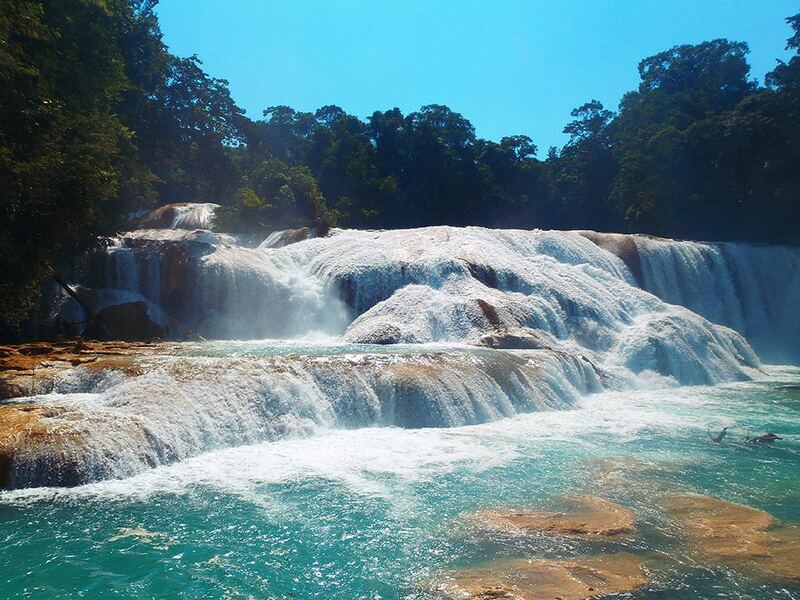 This heavy white cascade of water dropping into a turquoise blue river is just one of the many reasons why you need to visit Mexico. 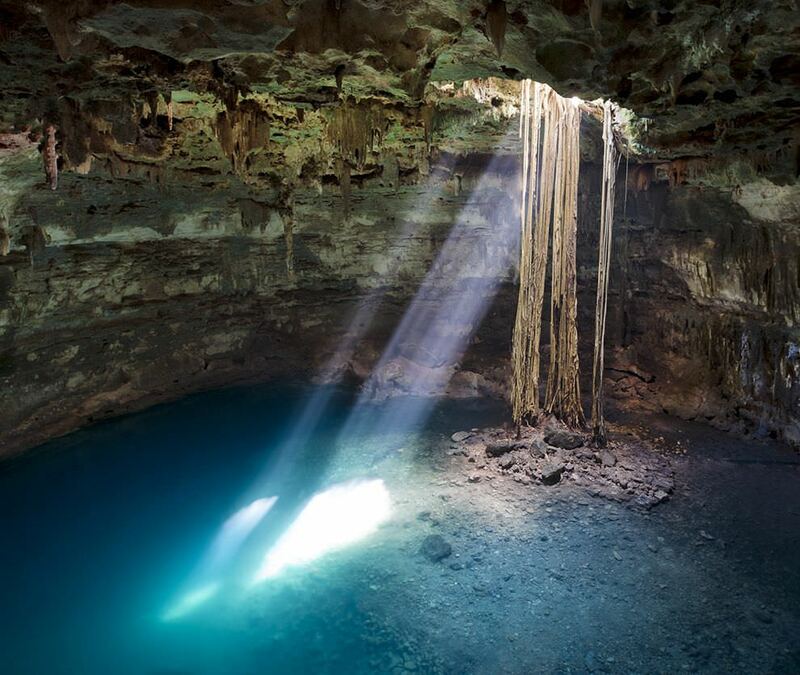 No, that’s not a typo: there actually is an underwater river in Cenote Angelita in the Yucatan Peninsula of Mexico. Good question. 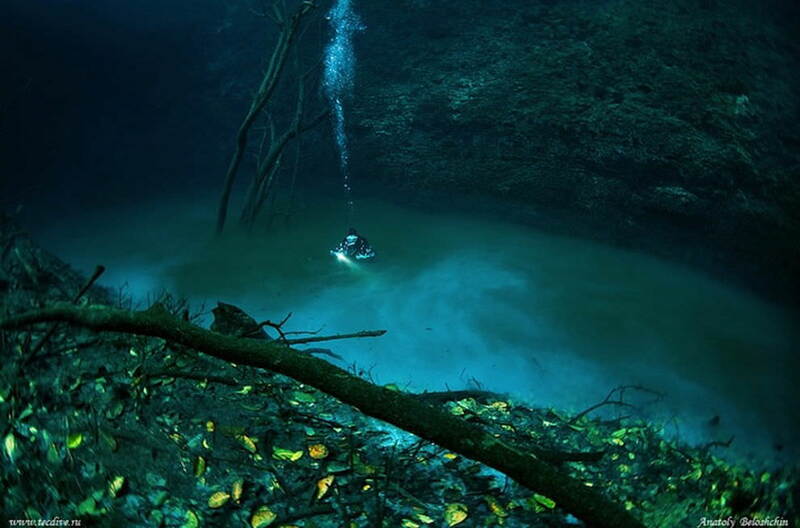 The “river” is actually a separate flow of saltwater beneath the freshwater of the cenote above. A three foot layer of Hydrogen Sulphide keeps the freshwater and saltwater separate. Since the saltwater is heavier, it sinks to the bottom and flows just like a regular river. It looks just like regular river as well, except, you know, it’s all underwater. That’s why the people in all these pictures are wearing scuba suits! 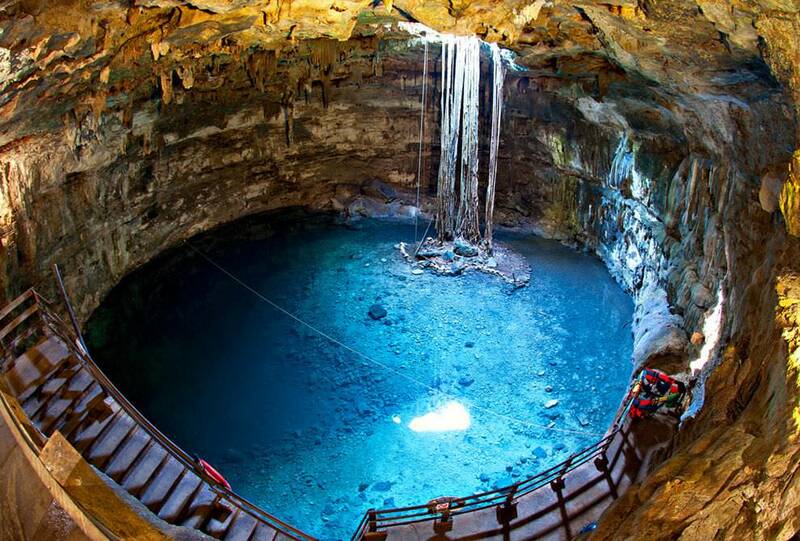 There are thousands of sinkholes in the Yucatan Peninsula – sinkholes formed when limestone caves collapse, revealing underwater pools. 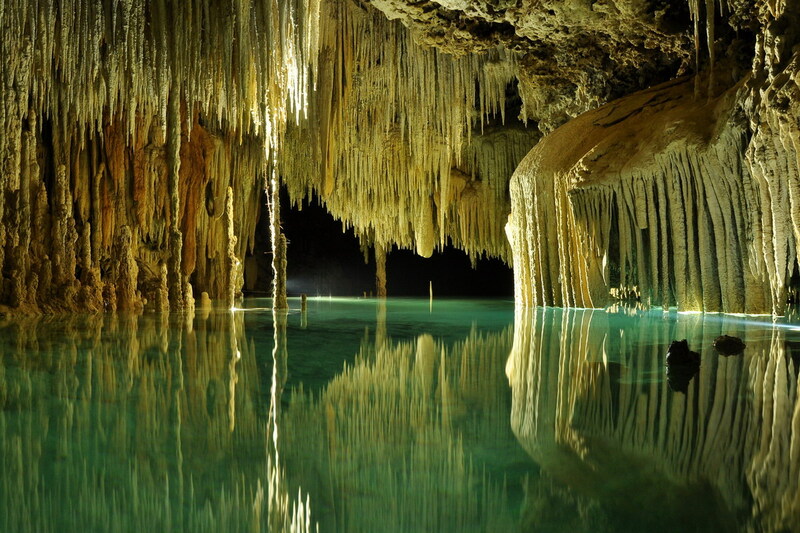 Because of their particular topography, most cenotes tend to be stunning. 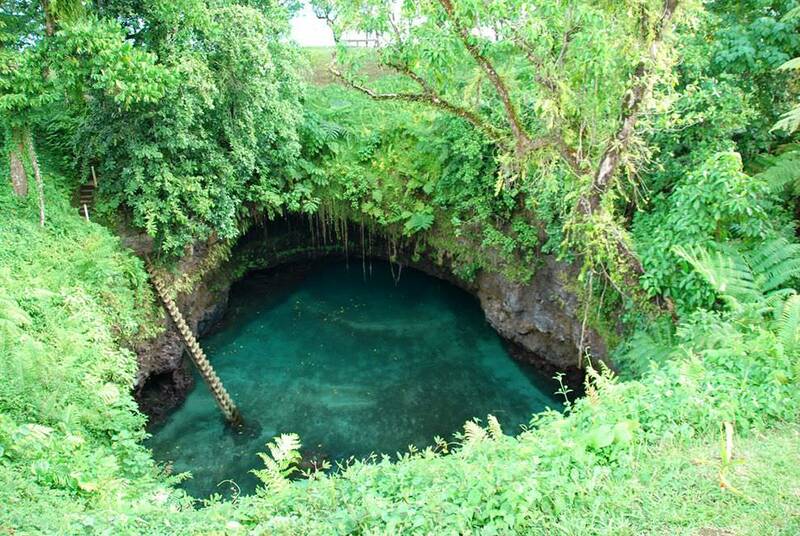 The Cenote Samula in Valladolid, however, is particularly beautiful, with steep limestone walls opening into turquoise blue waters. 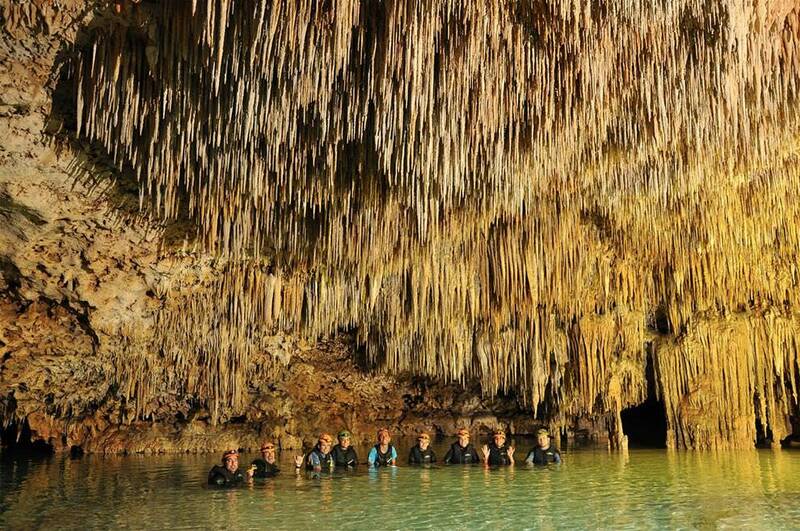 Rio Secreto, literally, “secret river”, is a river that goes through limestone caves. 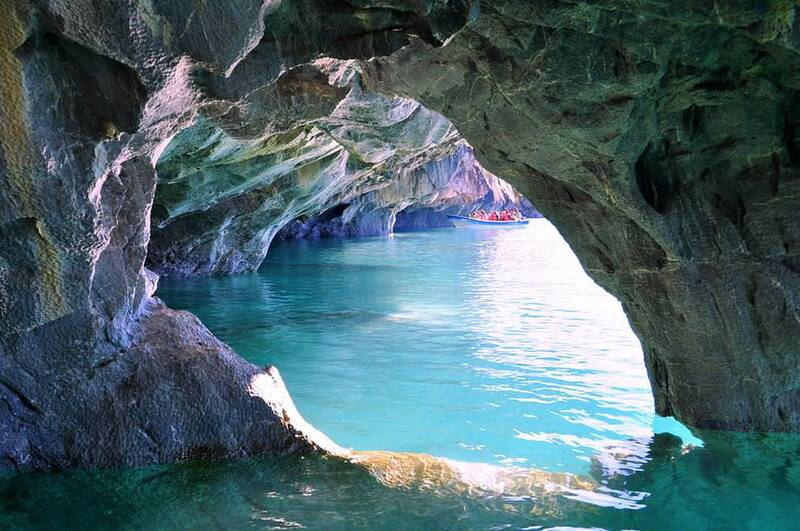 The waters are bright blue and the limestone greyish white and the light bounces off the walls and bathes the caves in beautiful blue efflorescence. Mesmerizing. Nope, this isn’t Photoshopped. 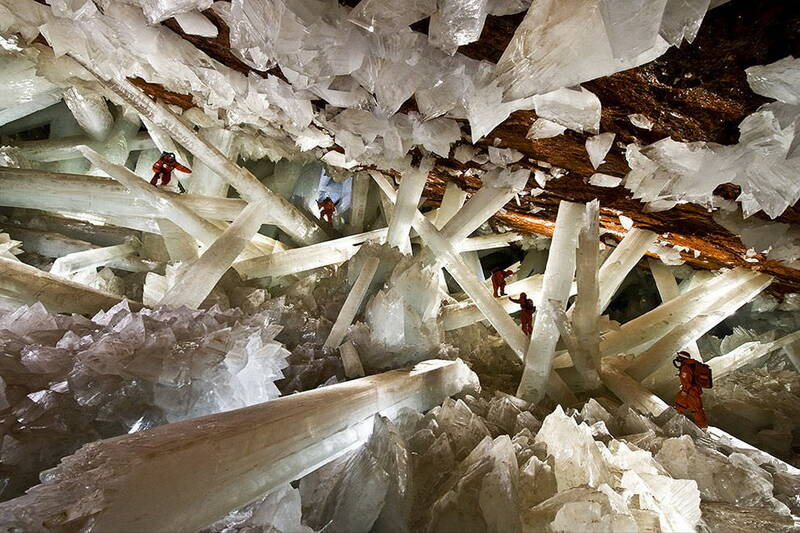 Those are actual humans inside a cave of giant selenite crystals inside the Naica Mines. 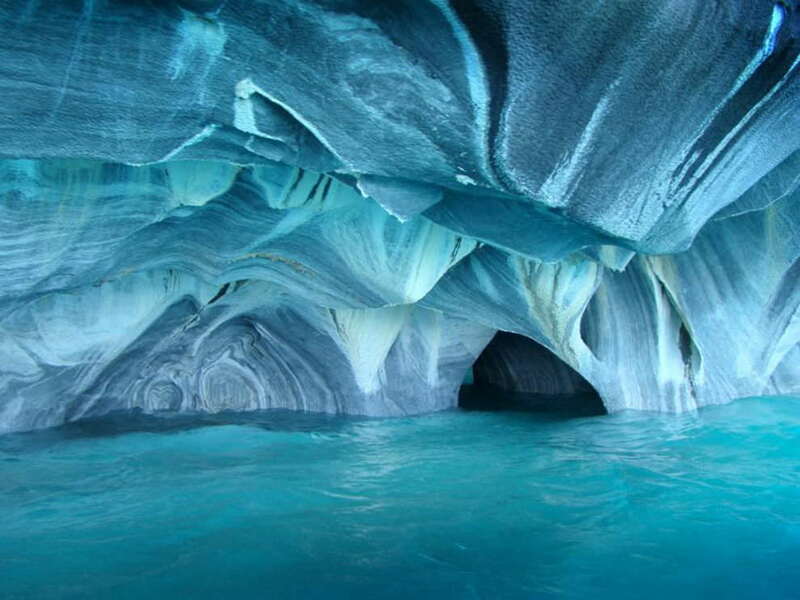 The crystals were formed millions of years ago when magma heated up gypsum inside the cave. 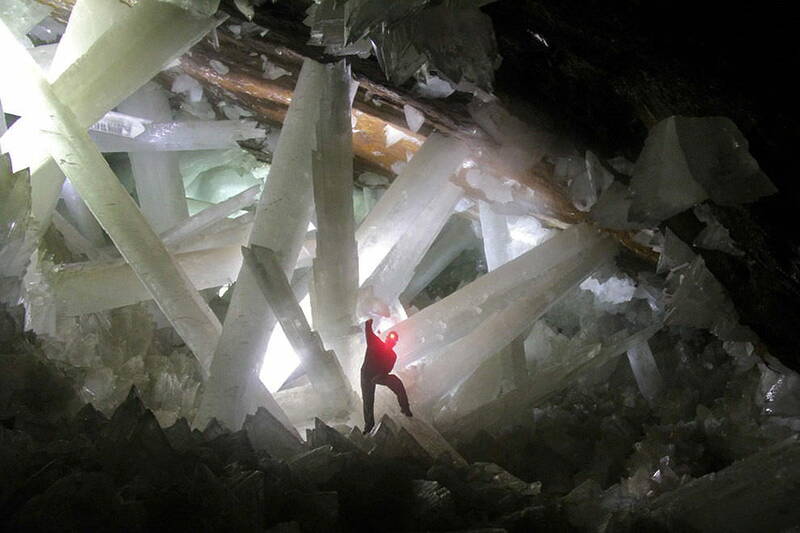 Over the years, as water flooded the caves, the gypsum turned to crystals, slowly growing to its current size. 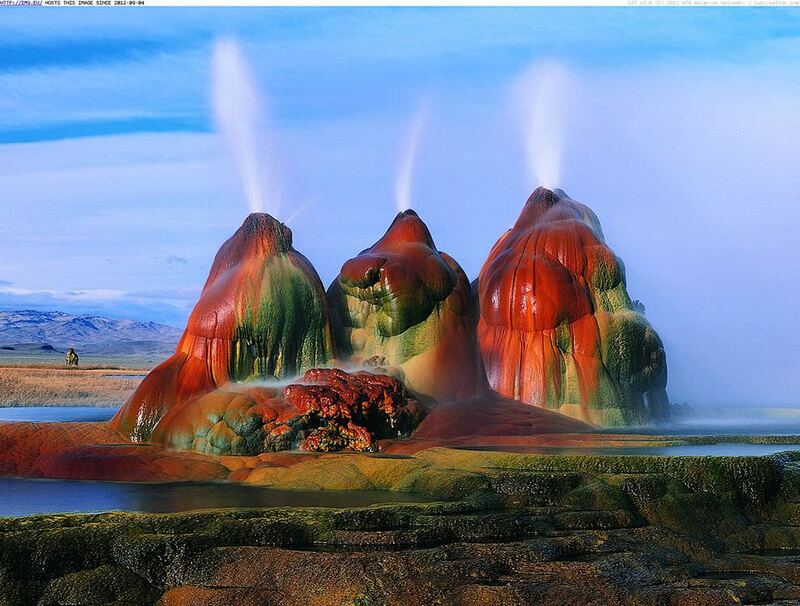 Easily one of the most surreal landscapes on Earth. 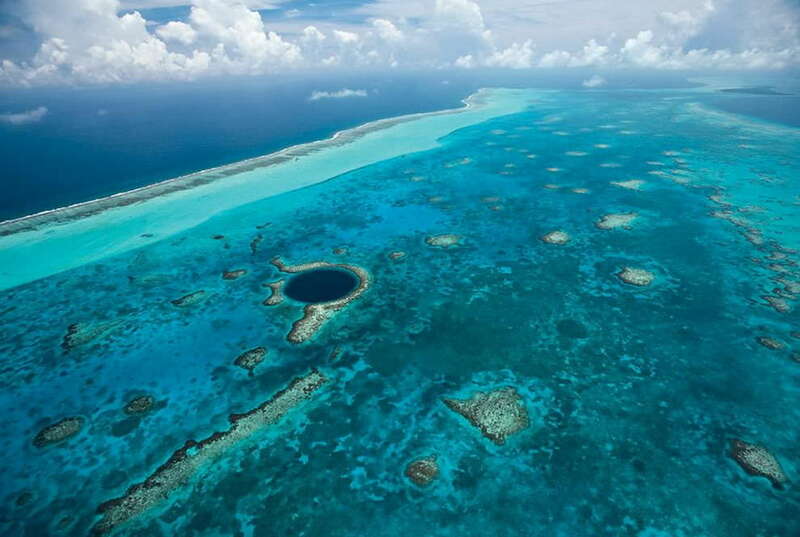 Picture this: you’ve anchored your boat a few dozen miles off the coast of Belize City. On a whim, you decide to head for a swim in the clear blue waters of the Caribbean. 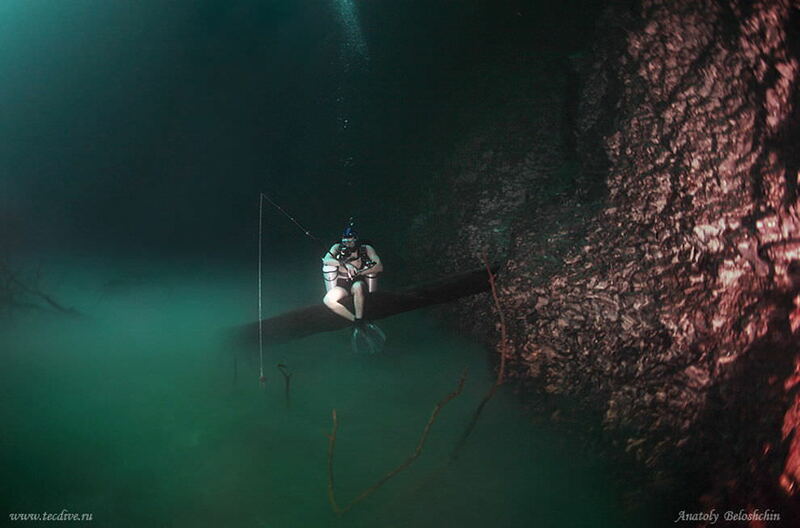 You happily paddle away, when suddenly, the ocean floor gives way beneath your feet and you come face to face with a seemingly unending drop into a pit of darkness. Scared? 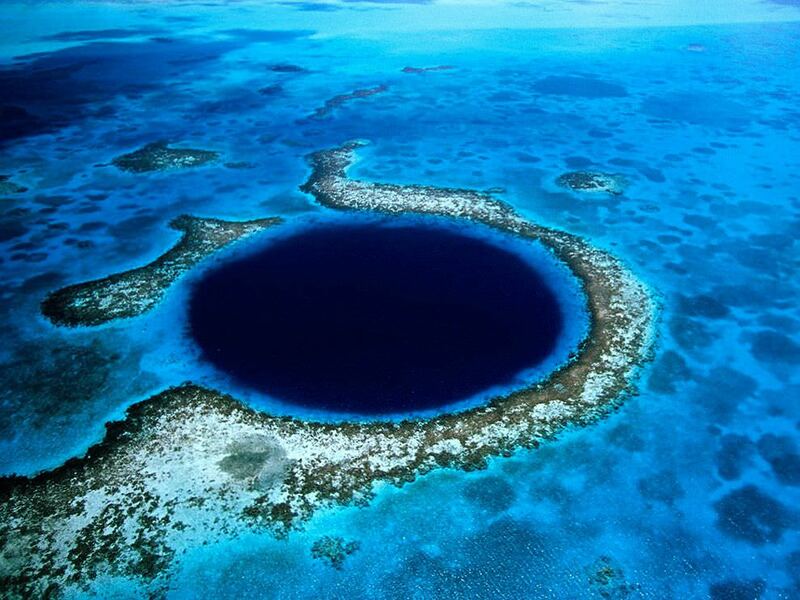 This is the Great Blue Hole of Belize, one of the best scube diving destinations in the world, and a surreal sight, no matter whether you’re on a boat, or in the water with a diving tank strapped to your shoulders. 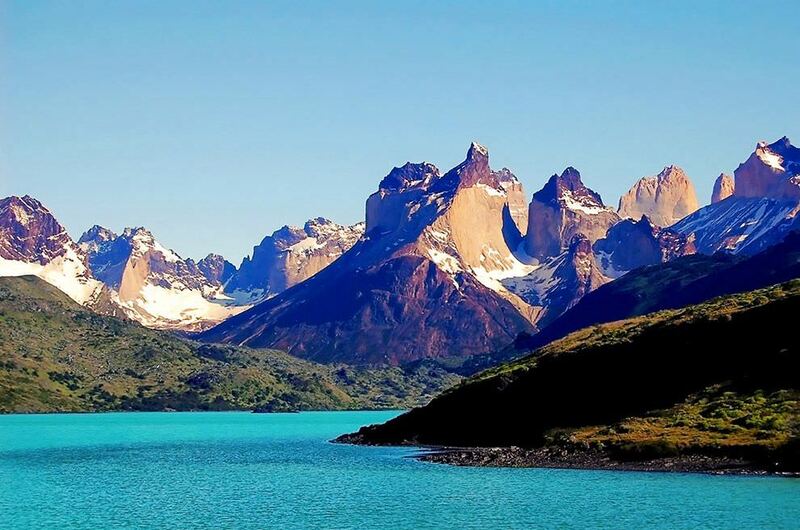 The Torres del Paine National Park in Chile is a national treasure, a stunning expanse that stretches nearly a 1000 square miles and is covered in mountains, forests, glaciers, lakes and rivers. The most stunning sight in this park, though, is the Paine mastiff, a spectacular formation of granite rock spiralling above the landscape. 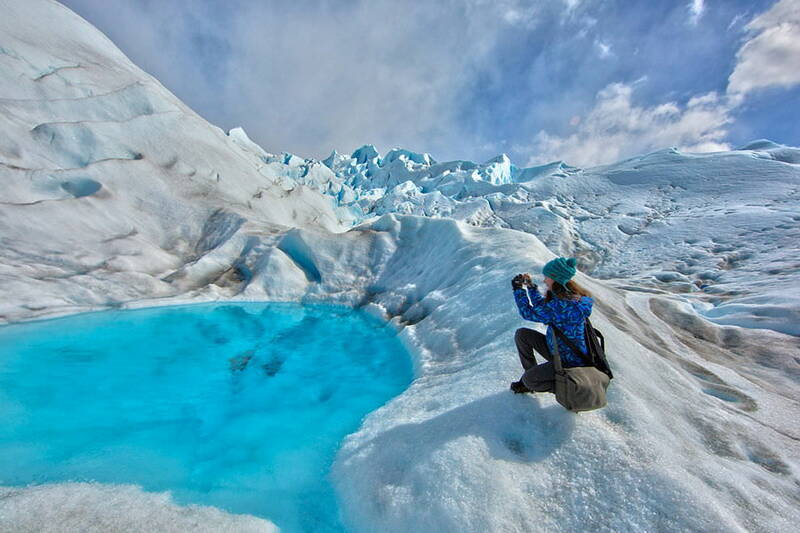 The Perito Moreno Glacier is one of Argentina’s most important tourist landmarks, a cold, hard expanse of dull blue eyes that looks like something straight from Hoth. If you thought the Bonneville Flats were flat, wait till you see this. 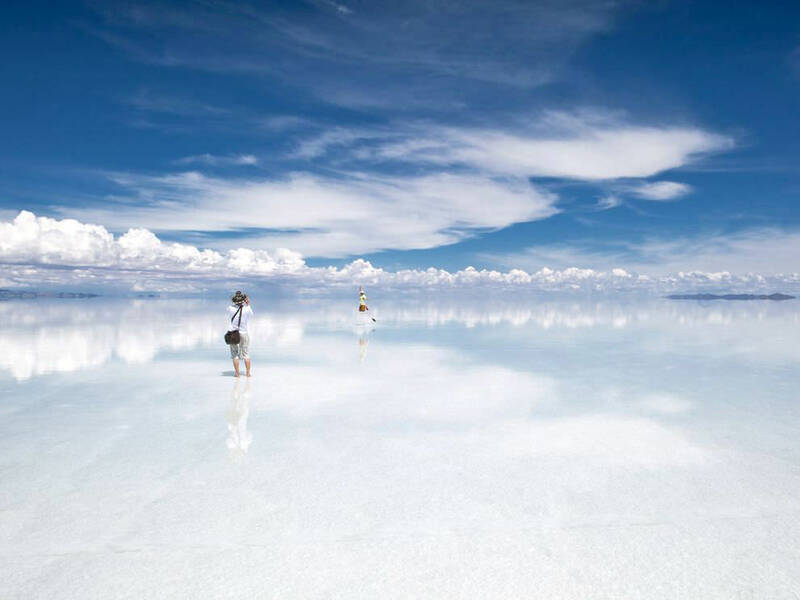 Salar de Uyuni is one of the flattest landforms in the world, located nearly 12,000 feet above sea level in the Andes. 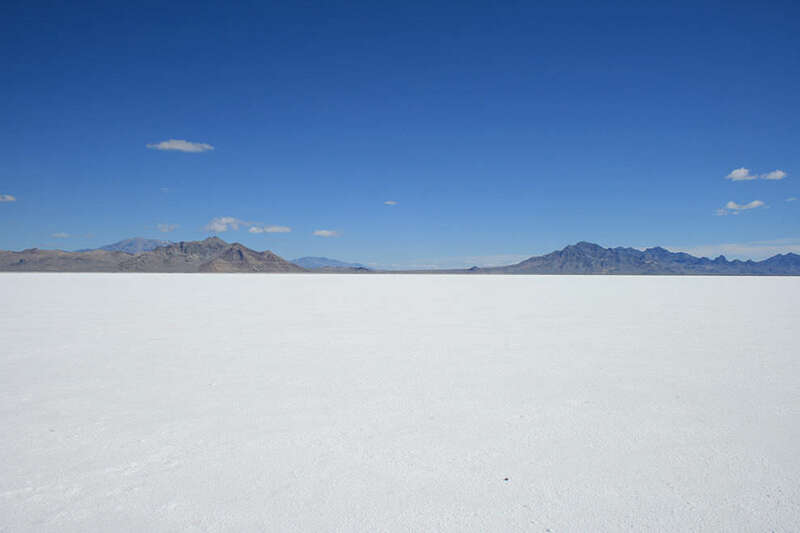 If that wasn’t interesting enough, Salar de Uyuni is also covered in a thick layer of salt (around 10 billion tons of the stuff). 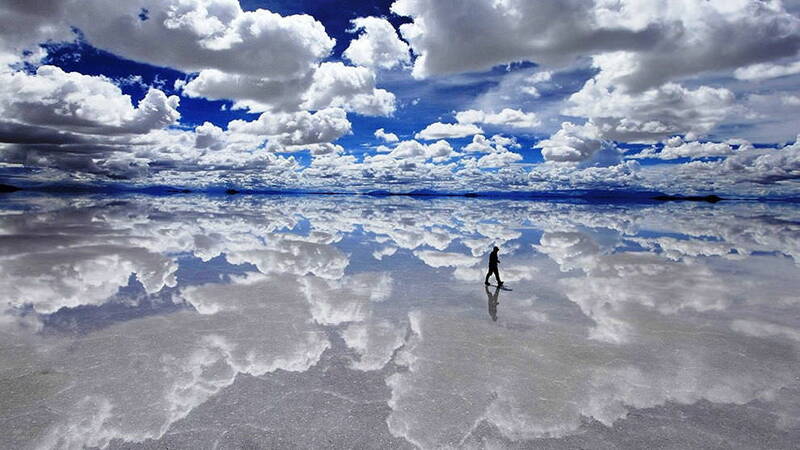 When it rains, a thin film of water covers the flats, turning it into the world’s largest (and most surreal) mirror. 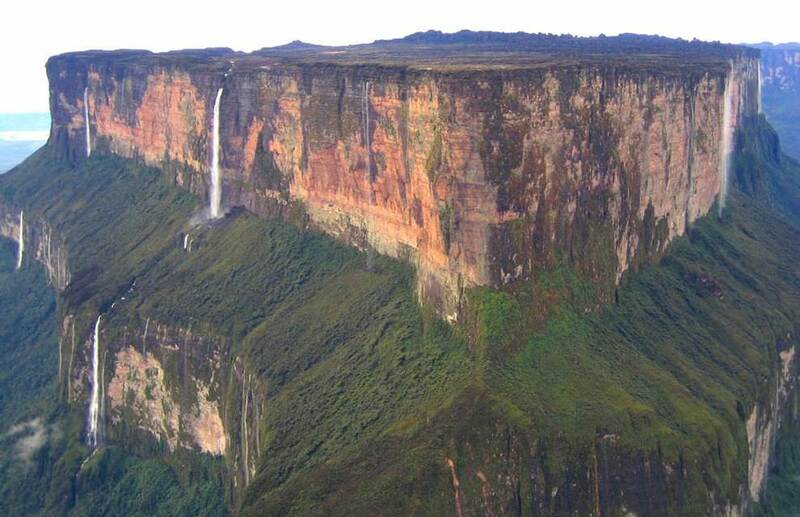 Mount Roraima was also the inspiration for the mountain in Pixar’s Up. 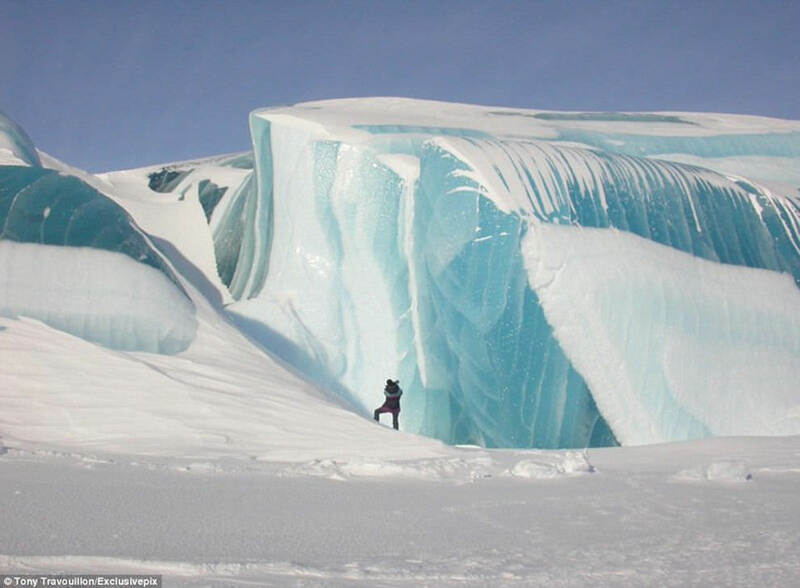 If you thought the Niagra Falls is neat, wait till you see this. 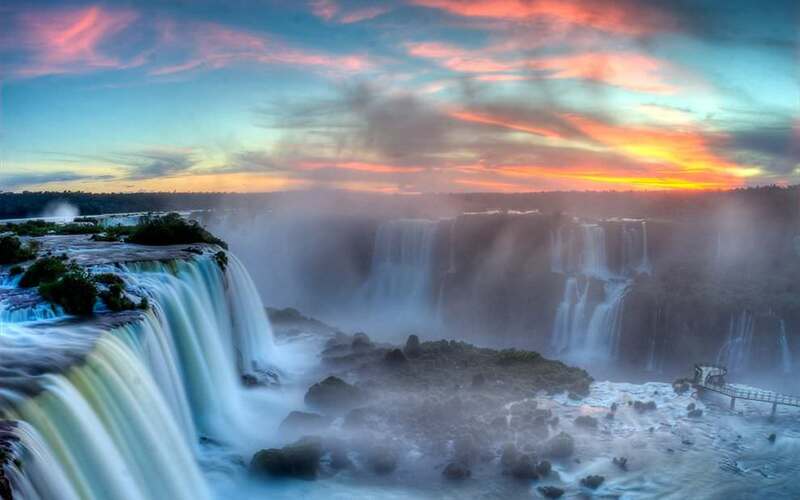 The Iguazu Falls is one of the largest curtains of water in the world, a stunning torrent that spills over cliffs 270 feet high at a rate of 1,756 cubic meters per second. Little wonder that Eleanor Roosevelt sighed “Poor Niagra!” upon sighting these falls. 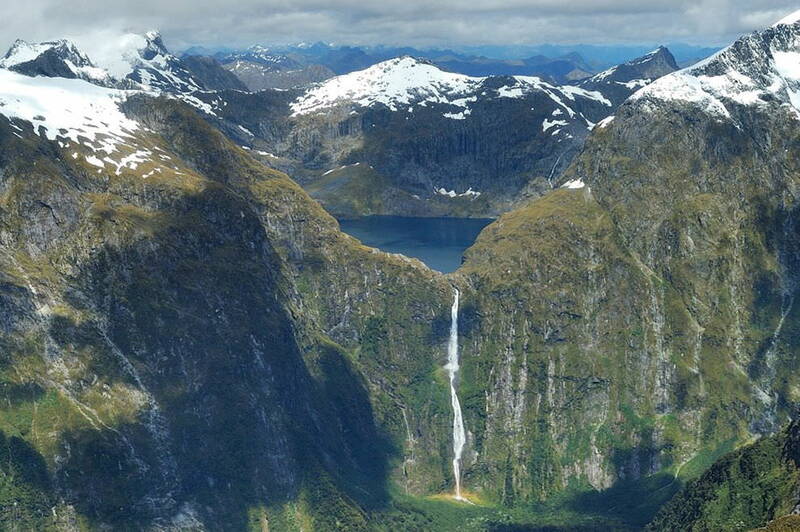 The best part is that you can walk right up to the falls on walkways and observation platforms. 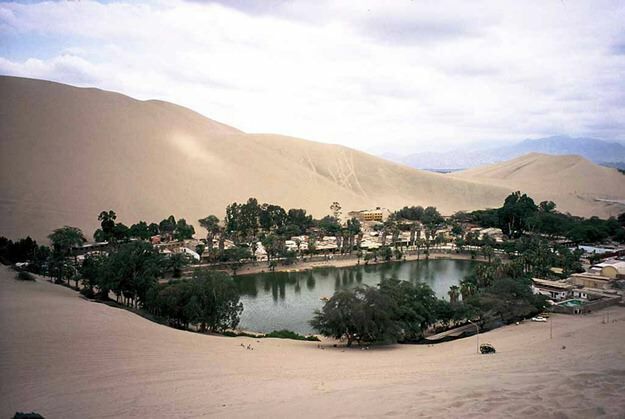 Like the Crescent Oasis in China, the Huacochina Oasis is a natural lake in the middle of a desert – a surreal, mirage-like sight. 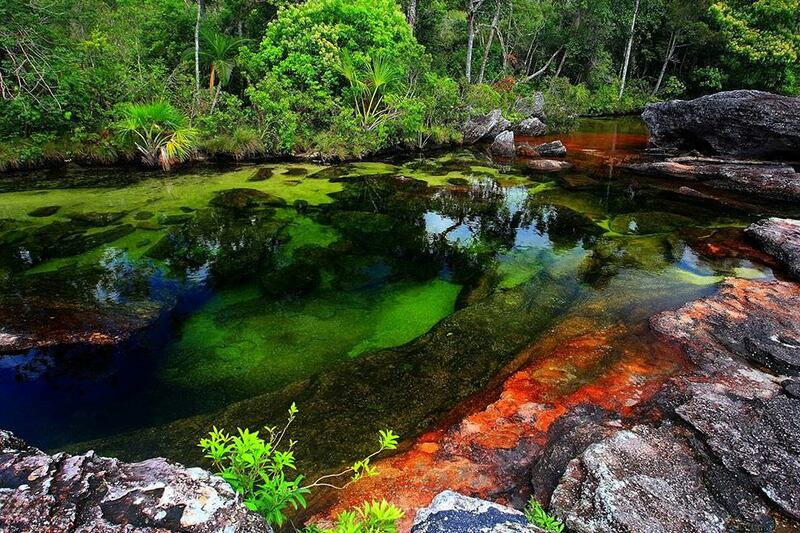 This river looks like it swallowed a rainbow whole. 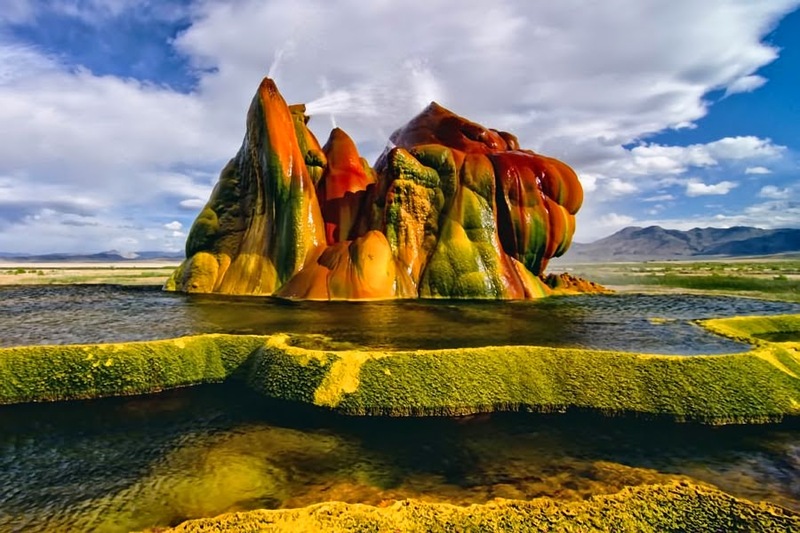 Often called “The World’s Most Beautiful River”, the river gets its brilliant colors from the presence minerals and riverweed. 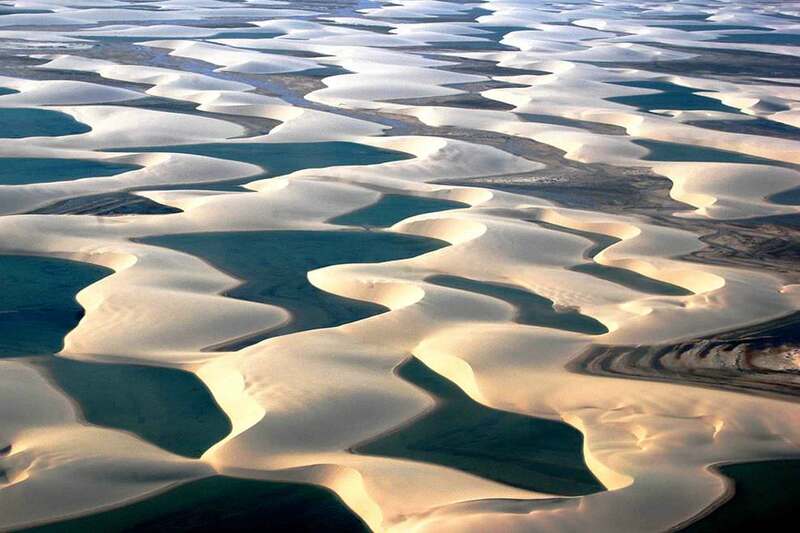 Sand dunes and water aren’t two things that really go together, but in the Lencois Maranhenses National Park, sand and water mix together as far as the eye can see. Often mistakenly called a “desert”, this region actually gets plenty of rainfall. 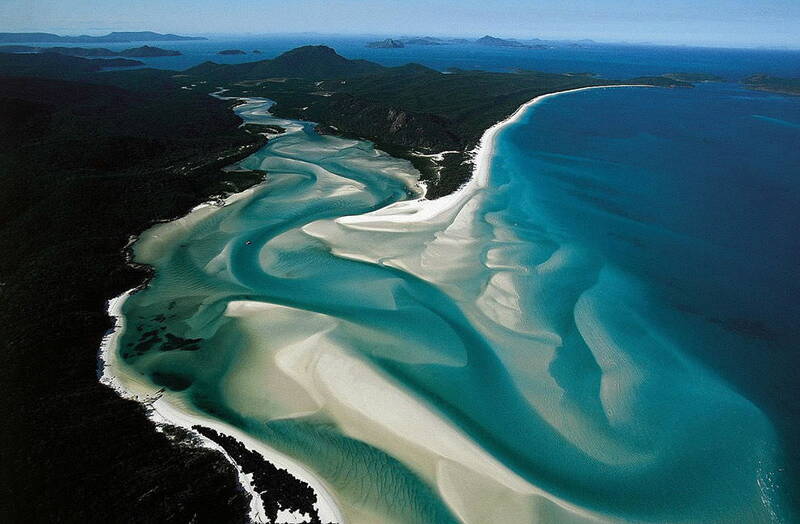 This results in pockets of water getting trapped in between dunes, leading to the creation of these stunning lagoons. This park is famous for two things: its stunning ‘Submarines’ or wind-eroded rock formations, and the fact that its rocks hold the world’s most well-preserved collection of Triassic Period fossils. 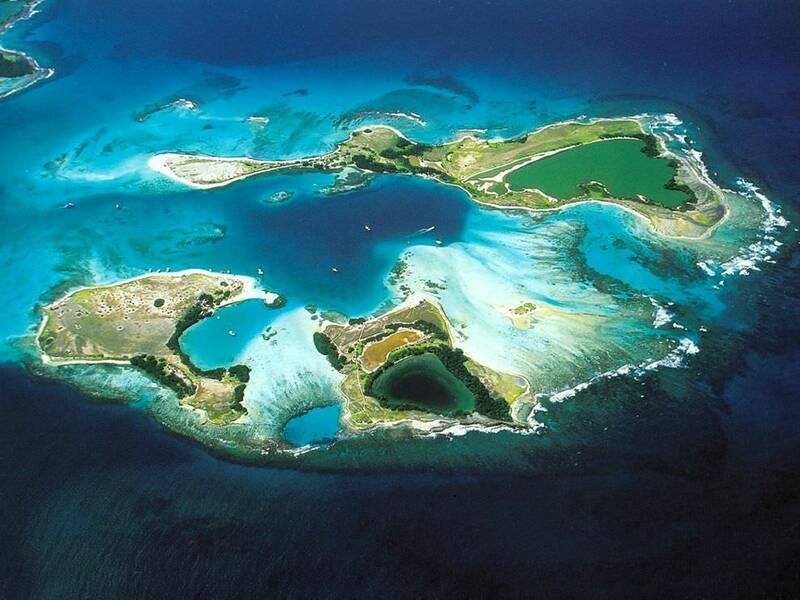 Pristine coral reef, white sands, and turqouise blue waters make this little collection of 350 islands one of the most surreal places in South America. 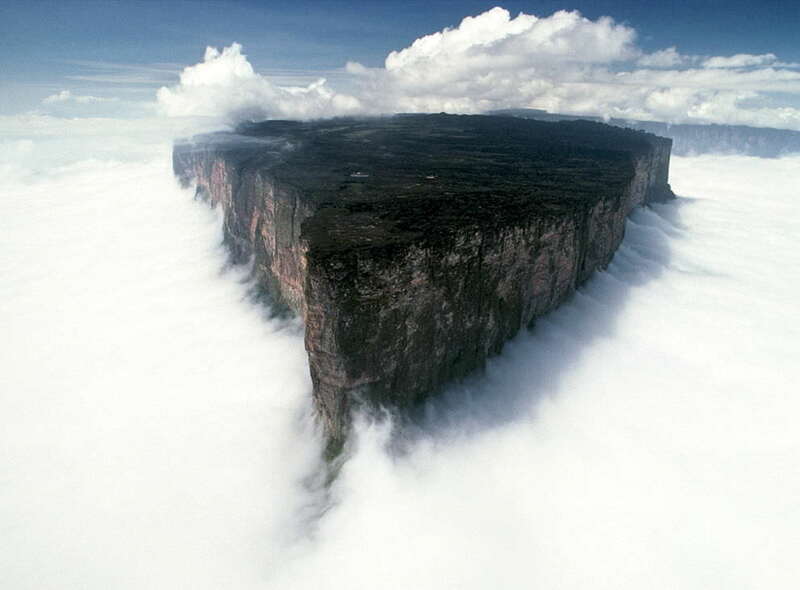 Chapada dos Veadeiros is one of the oldest rock formations in the world with an estimated age of 1.8 billion years. 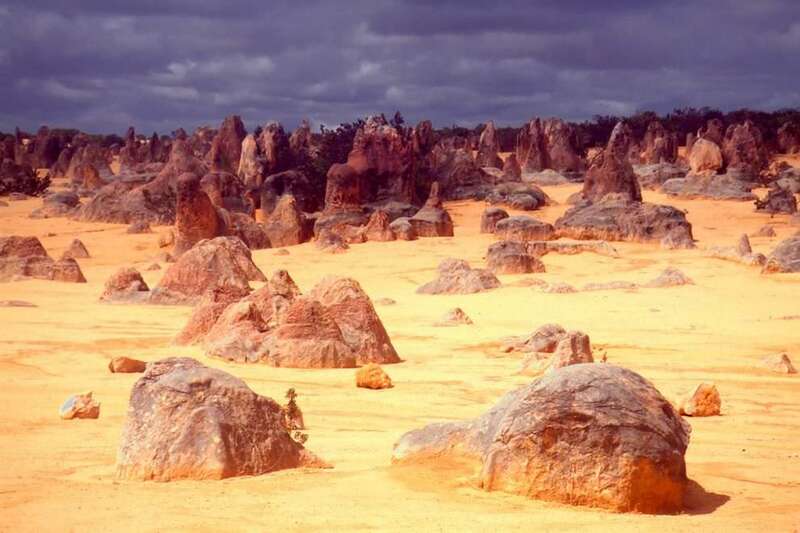 Over millions of years, the rocks in this plateau have eroded into some pretty surreal shapes, none more so than the Valley of the Moon, which, as it name implies, looks pretty otherworldly. 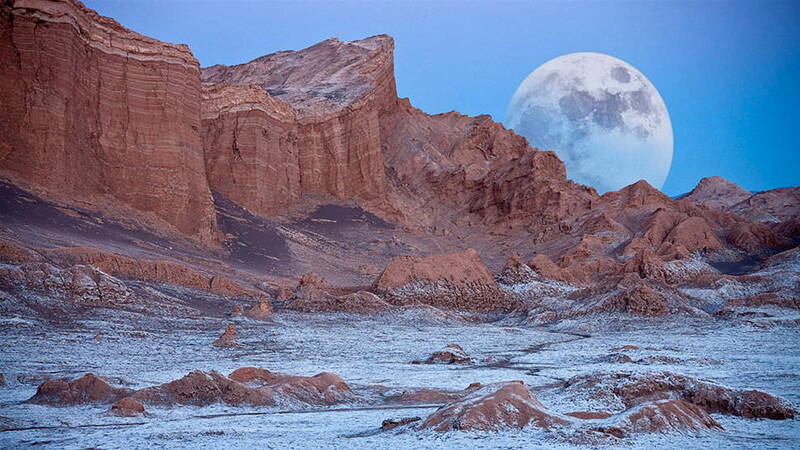 This isn’t a typo; there is more than one “Valley of the Moon” in South America. This one is high up in the Atacama Desert in Chile and counts among the driest places on Earth. 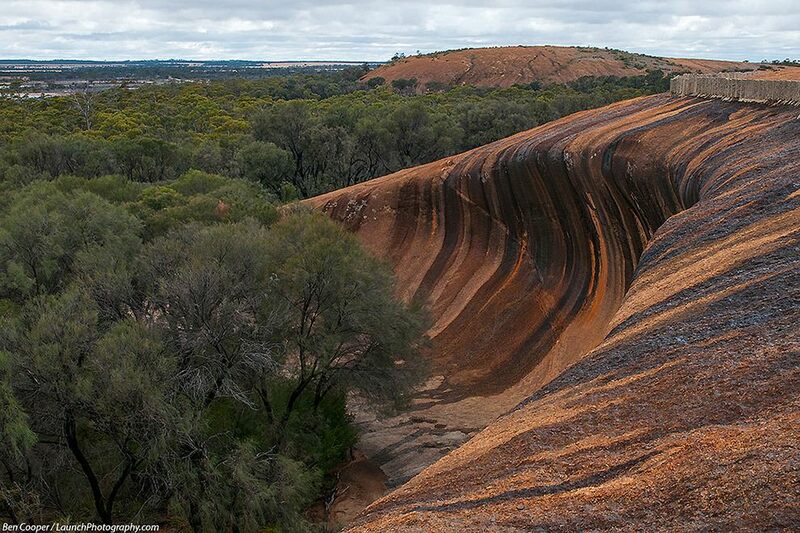 Many parts of this valley haven’t received a single drop of rain in hundreds of years! 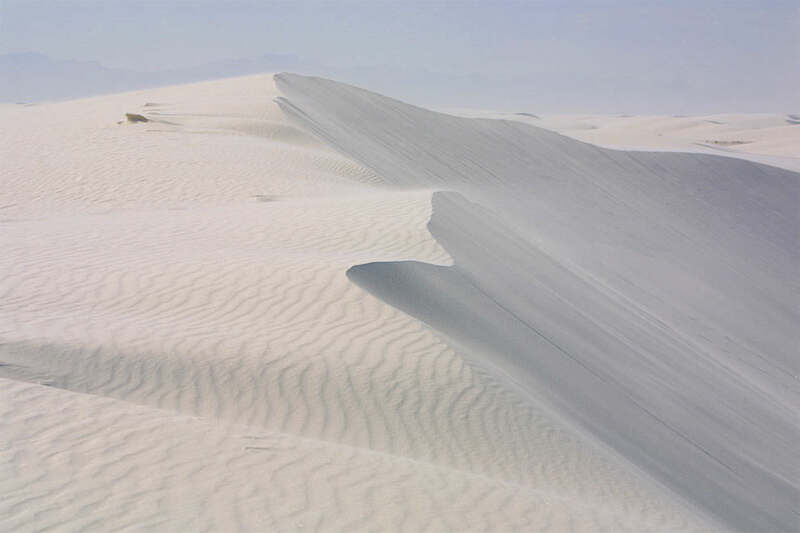 The harshness of the surface makes the region look not unlike a lunar landscape. In fact, NASA even sent its Mars rover to traverse this region to test its durability on Martian soil. 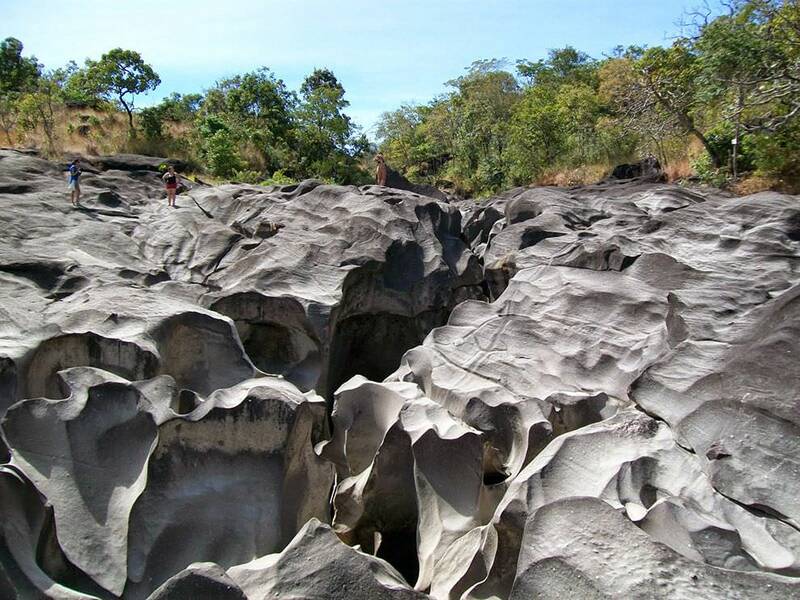 As dry and forbidding as it might be, it is also very beautiful, with sunsets in brilliant hues of pink and purple, and surreal gray-white rocks dotting the surface. Just make sure to carry plenty of supplies though – there is no human habitation for hundreds of miles. 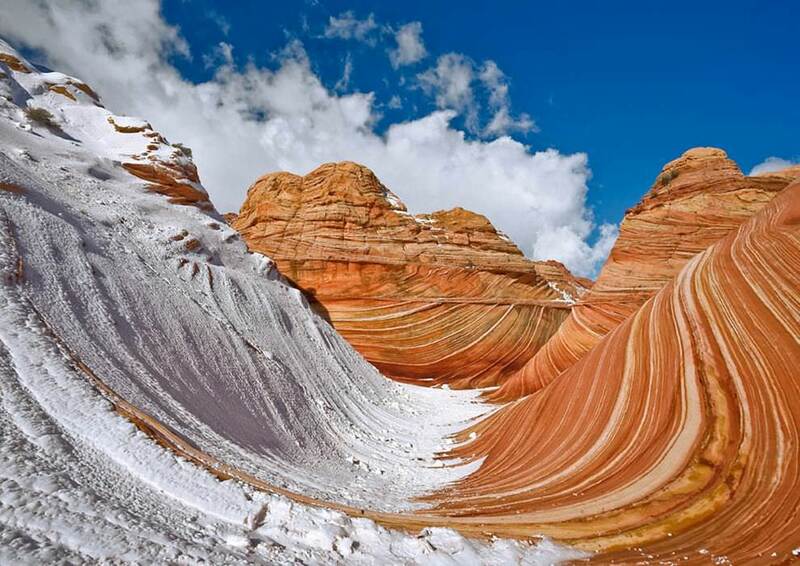 What looks like a wave frozen solid is actually a natural rock formation carved into this peculiar shape over centuries of erosion. 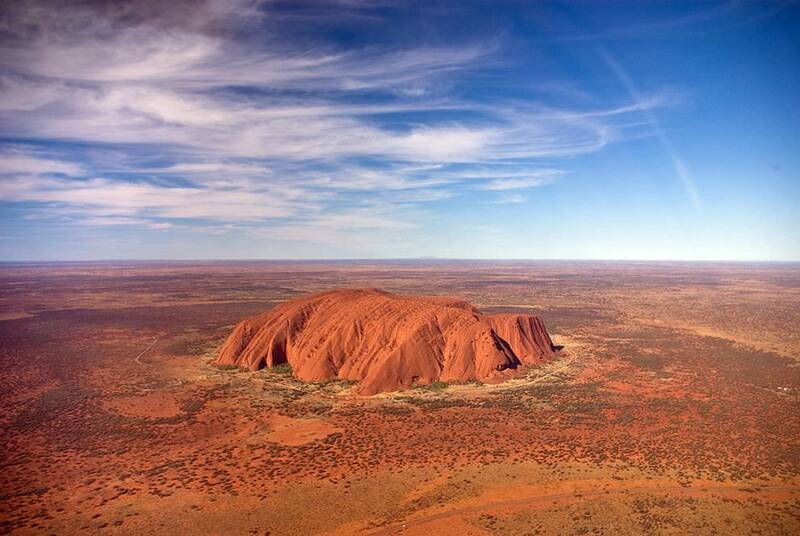 Also called “Ayers Rock”, Uluru is an instantly recognizable Australian landmark – a huge hunk of rock rising dramatically in the middle of vast flatlands. 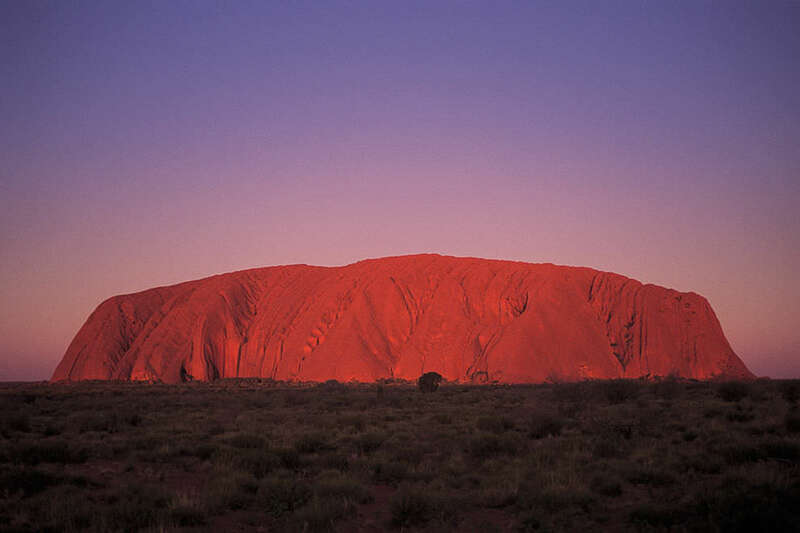 The rock appears to change color depending on the direction and intensity of sunlight. 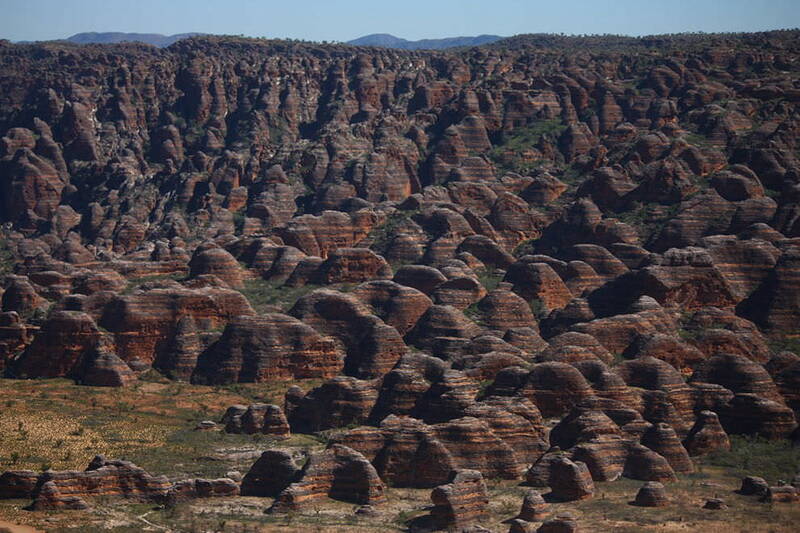 Local aborigines hold the rock sacred and ascribe many of their origin myths to this strange and surreal landform. 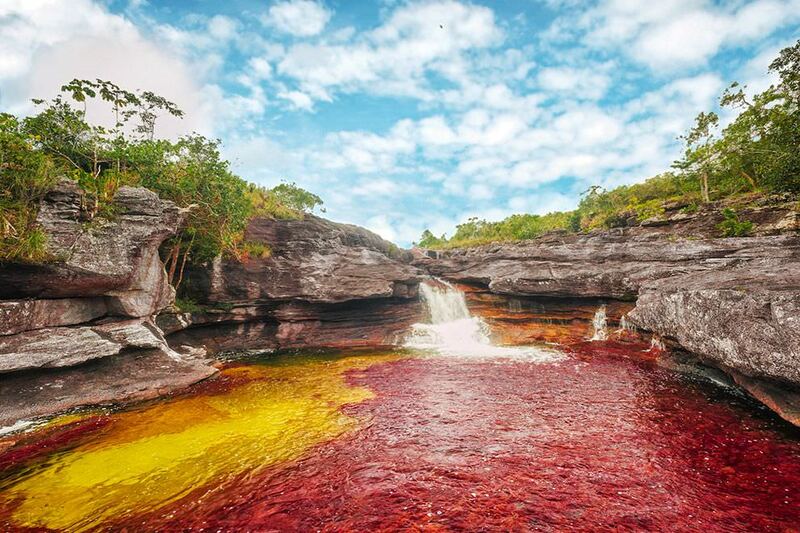 What looks like bad Photoshop is actually a naturally occurring lake that gets its characteristic pink shade due to the presence of certain microorganisms in the water. 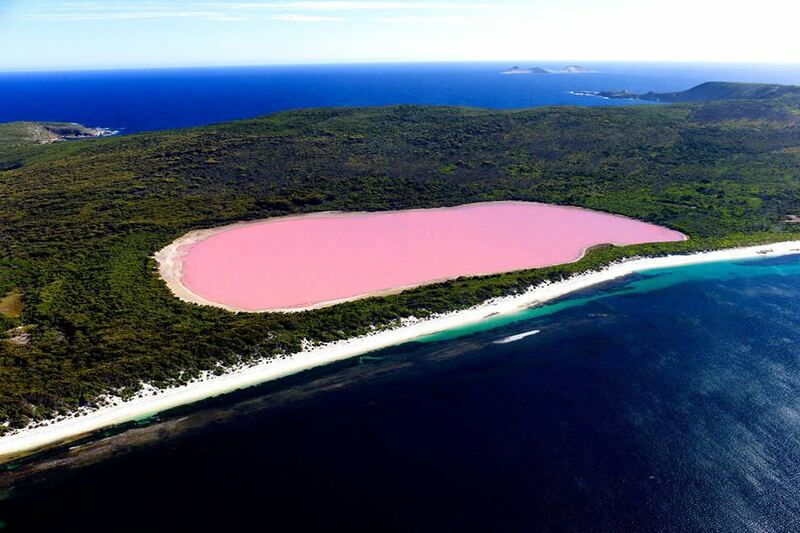 The lake appears a bright bubble-gum pink when seen from above, though up close, the waters are close to light pink. Don’t let the color bother you though; the lake is perfectly safe for humans. Though we can’t promise your friends won’t be jealous when they see pictures of you frolicking about in its pink waters! 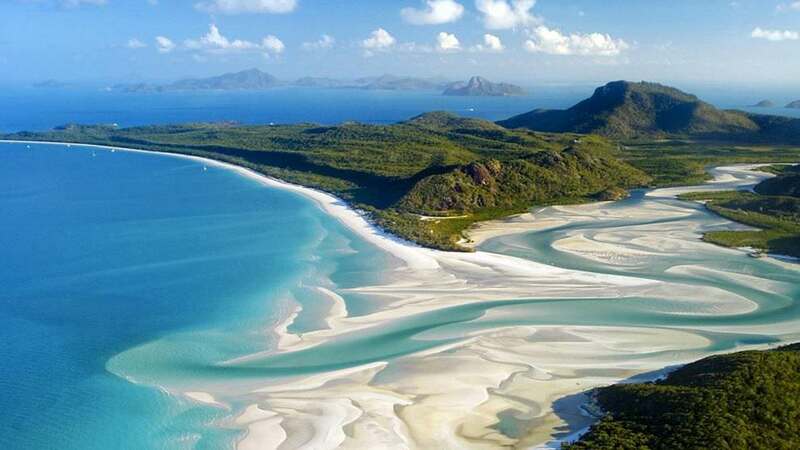 White sand, blue ocean and aqua-green lagoon come together in this surreal 4 mile stretch of heaven. 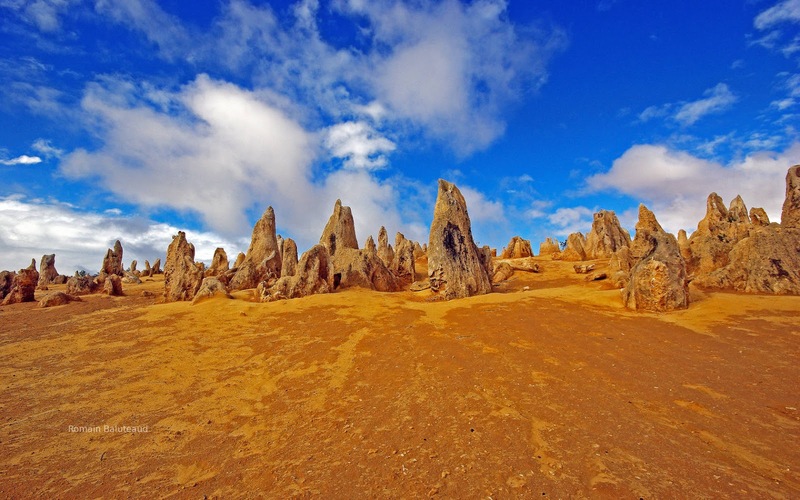 Jagged limestone rocks called “The Pinnacles” rise from the desert in this surreal formation in Western Australia. Like nature’s own Stonehenge, but only prettier. 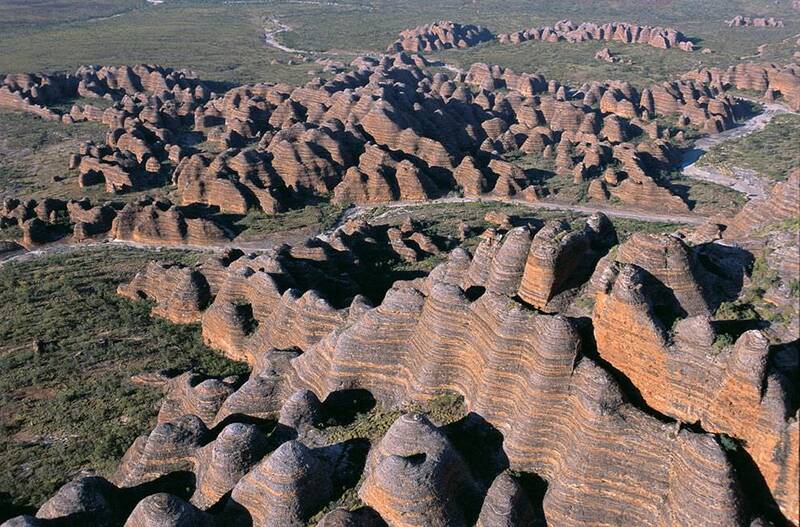 Don’t let the comically absurd name deter you – Bungle Bungles is one of the most striking land features in the Australian continent: a beehive shaped stretch of sedimentary rocks that look like bubbles of earth and stone bursting forth from the Earth. 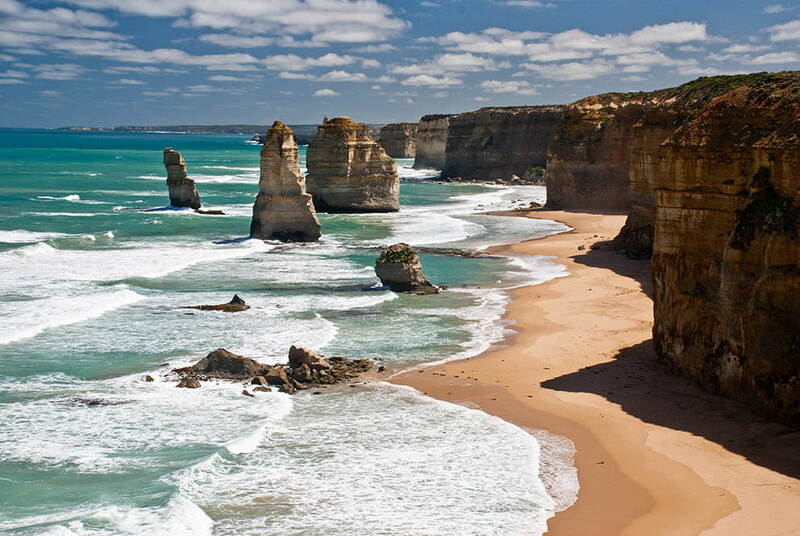 The Twelve Apostles is a collection of eight limestone stacks rising from the ocean. Their proximity to each other makes them a surreal sight, like fingers of earth reaching out from the ocean floor. 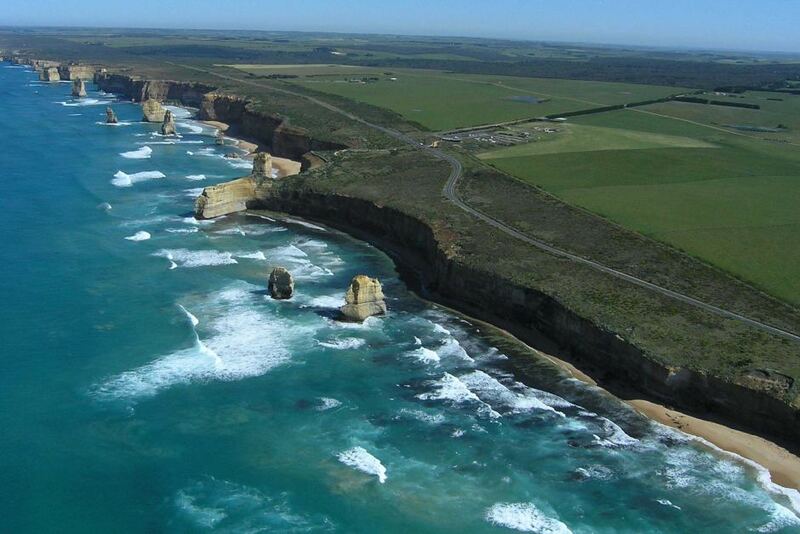 Best of all, the Apostles are located along the Great Ocean Road, one of the most beautiful roads in the world. 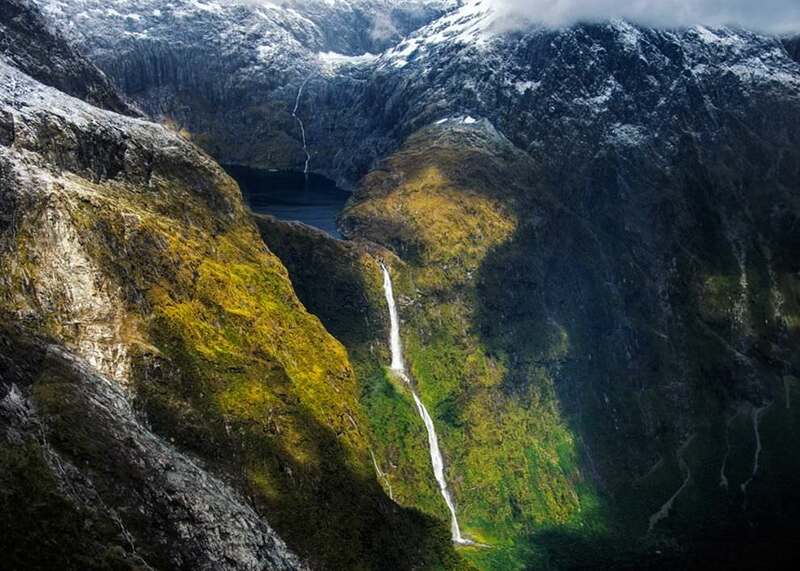 A large reservoir nestled deep within jagged mountain peaks drops a couple of thousand feet to the ocean floor – like a torrent of tears from the blue eyes of the mountain itself. 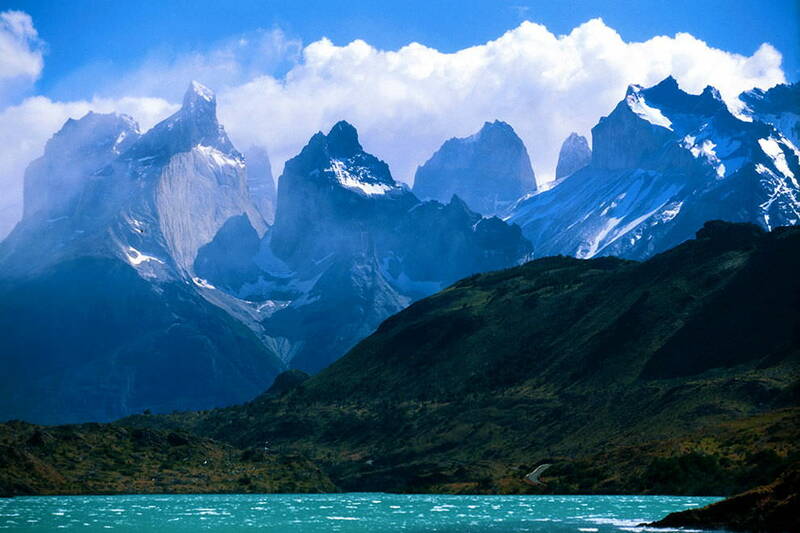 A breathtaking sight made all the more surreal by the beauty of the surrounding mountains. Standing at the edge of the viewing platform atop the Nugget Point Lighthouse feels not unlike standing at the edge of the Earth and staring at the endless blue of the Pacific beyond. As surreal an experience as any. 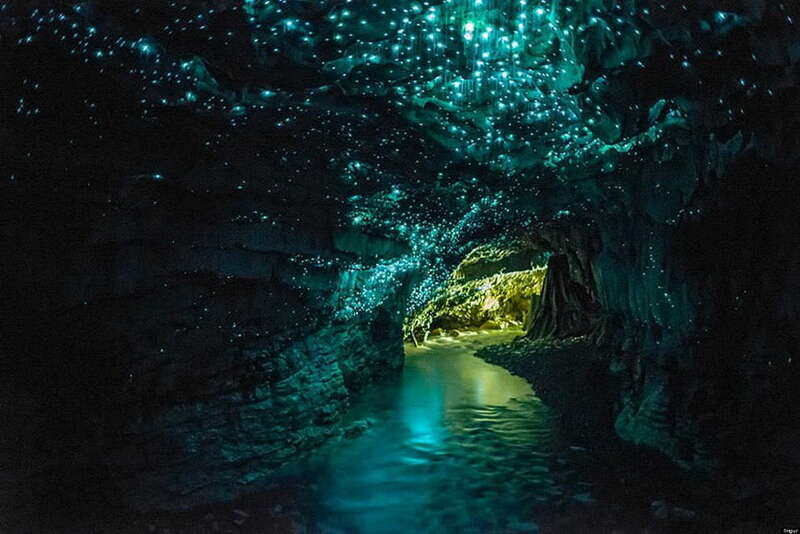 The glow worm is a species of insect unique to New Zealand. This insect radiates a tiny blob of luminescence. Glow worms can be found all over New Zealand, though no place boasts a populatio as heavy as the Waitomo caves. 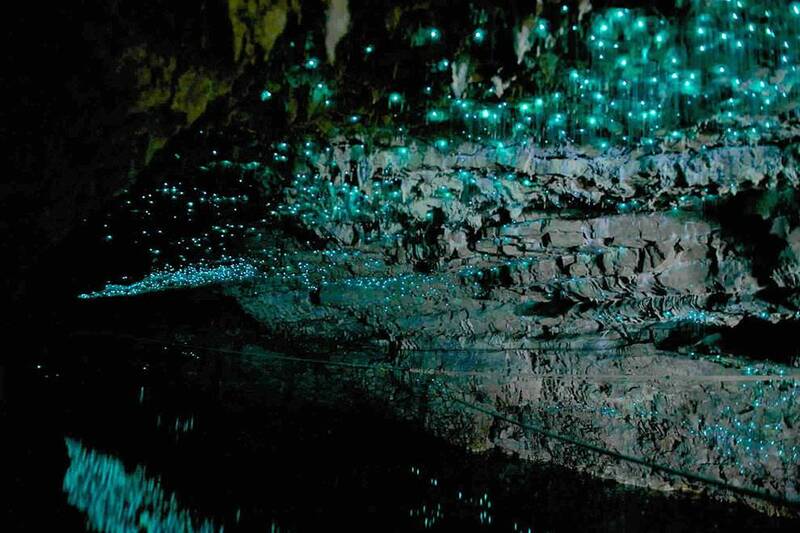 Glow worms line the walls of the cave, bathing it in surreal bio-luminescence – truly, the experience of a lifetime. 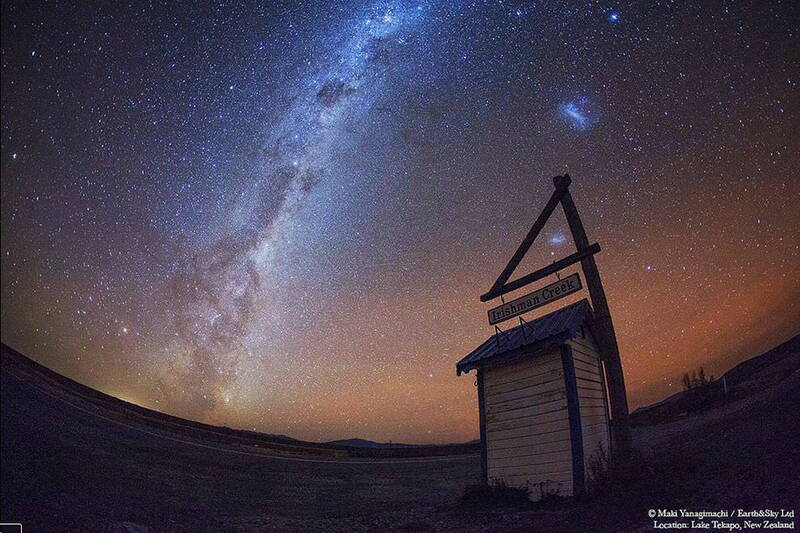 The Mackenzie Basin looks like any other part of New Zealand – until you look up. 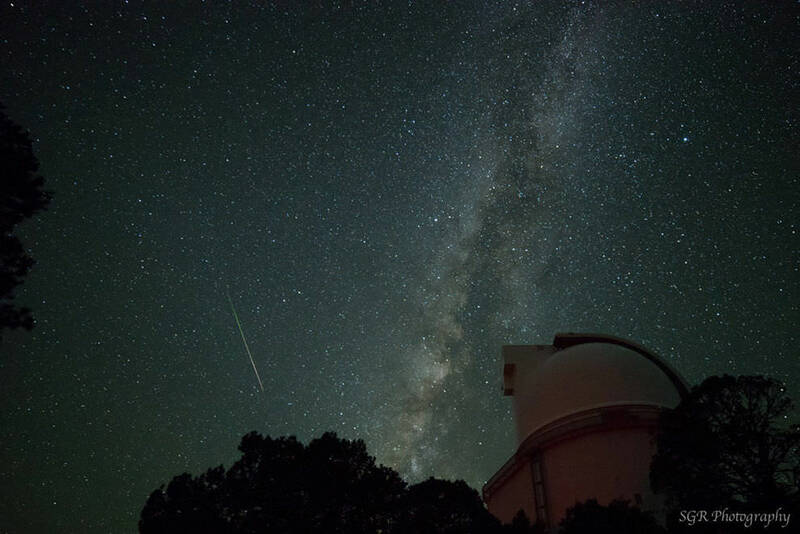 Millions upon millions of stars shine down upon you at one of the finest astronomical observation points on the planet. The sky over the Mackenzie Basin is completely devoid of light pollution, giving you breathtaking views of the stars and the Milky Way Galaxy. 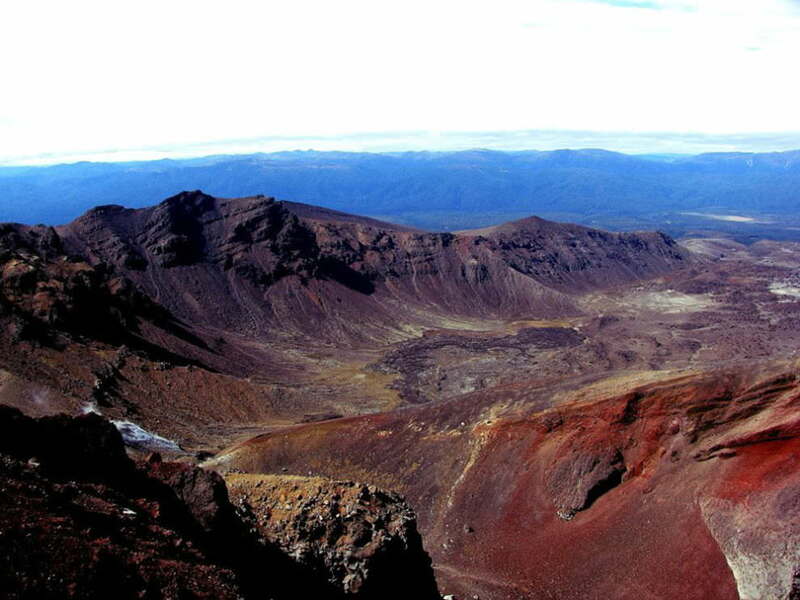 The sight is surreal and warrants a trek all the way up to the Mount John University Observatory. 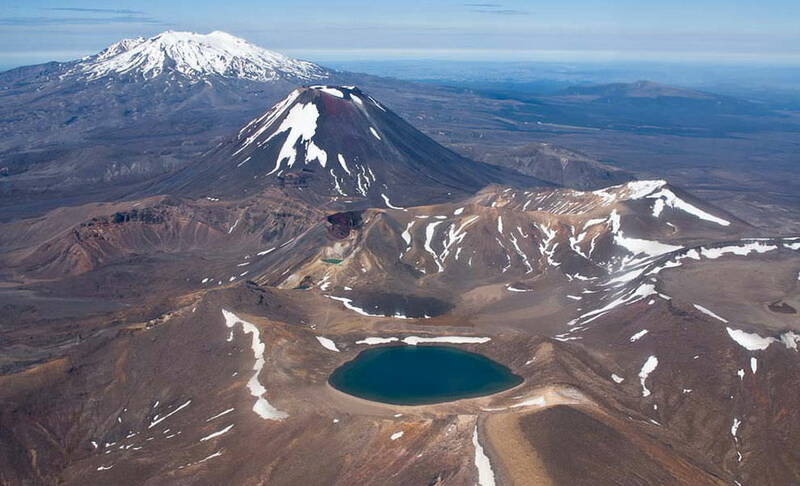 Yup, this vast stretch of volcanoes and ash and crater lakes was where Peter Jackson based his fictional Mordor in the Lord of the Rings movies. You can see why: the earth here is dark, smoke bellows from volcanoes, and not a living thing grows for miles upon miles. 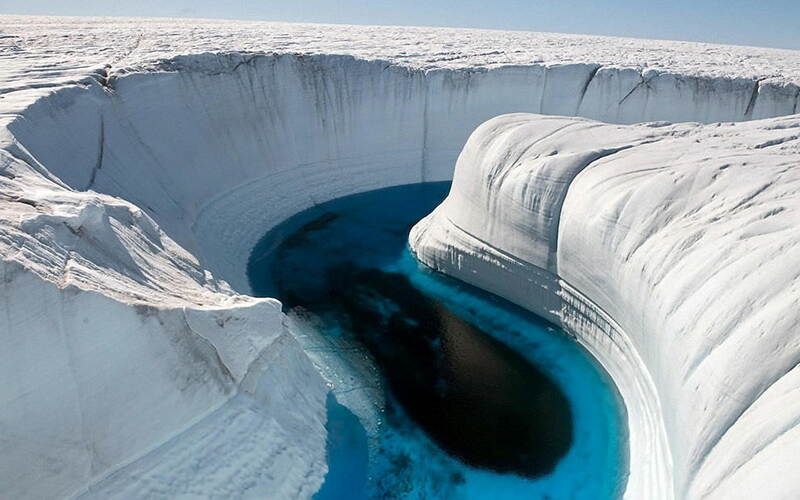 Easily one of the most forbidding – and surreal – landscapes on this planet. 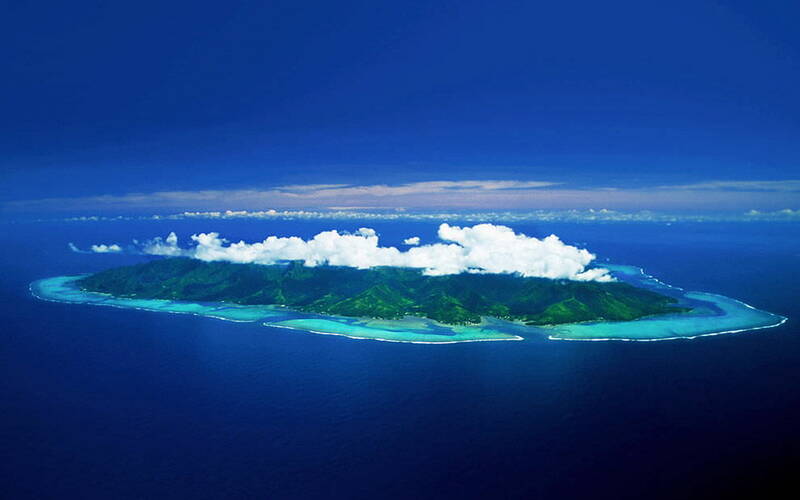 This tiny island in the society Islands of French Polynesia is beautiful with a capital B. 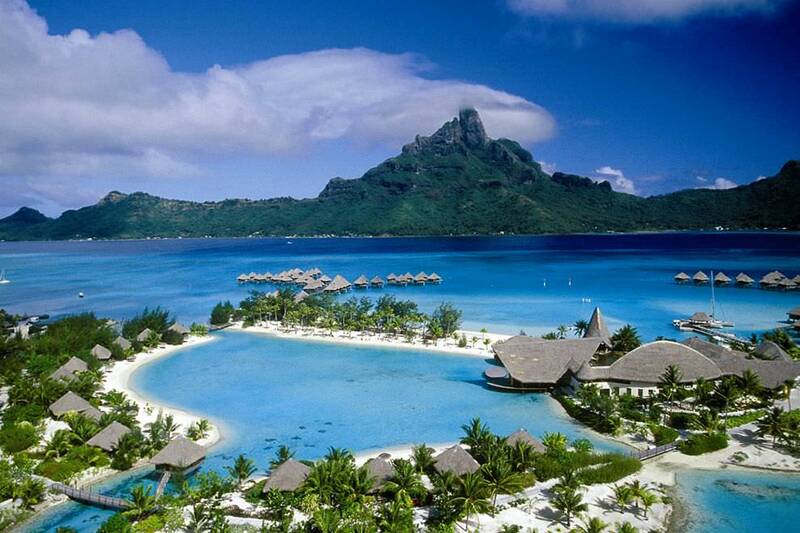 The sand is white, the interior lush and green, and the beach folded between lagoons and coral reef. Throw in two extinct volcano peaks rising from the heart of the island and you have the quintessential island paradise. 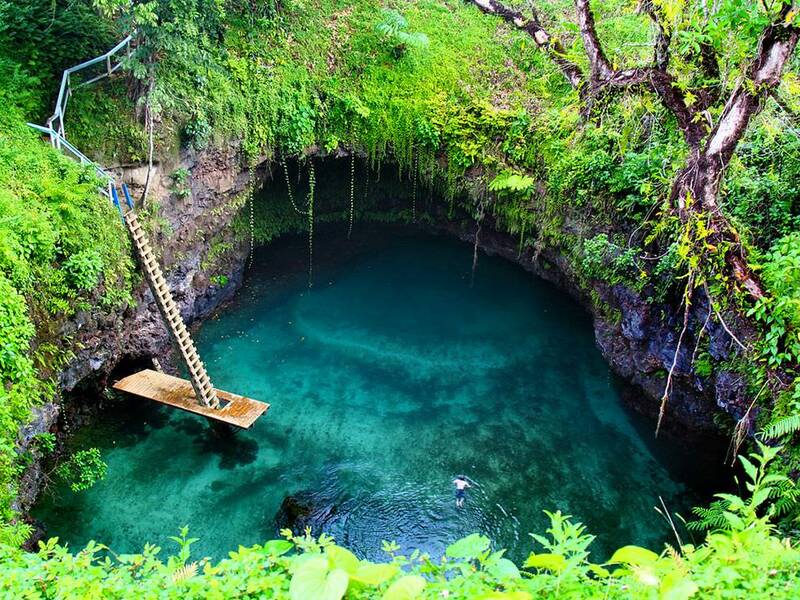 Tosua Pool, Samoa, is the most beautiful natural swimming pool you’ll ever swim in. 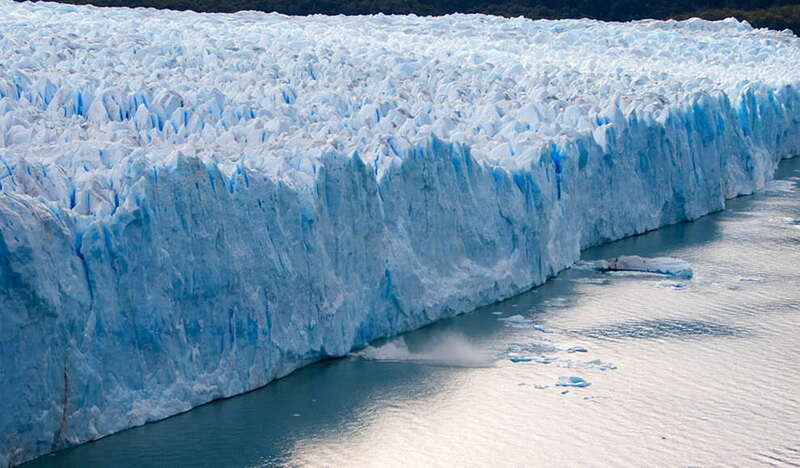 The ocean courses its way through sheer cliffs of ice in this stunning Greeland landform. 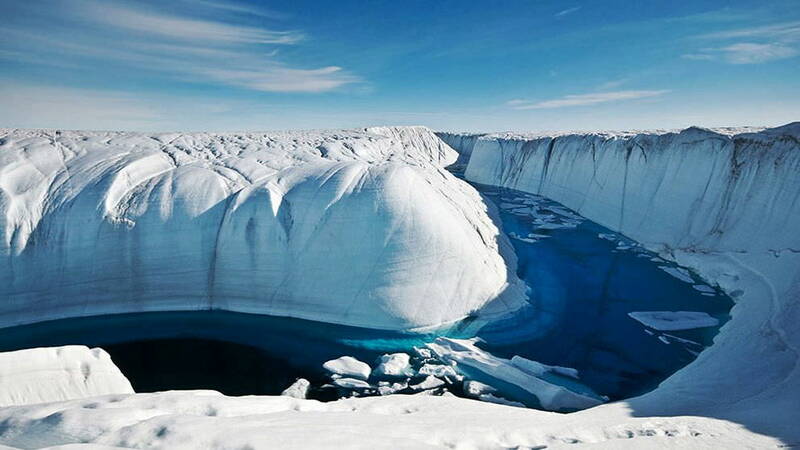 The deep blue of the ocean against the stark white of the ice is a sight you can never forget. 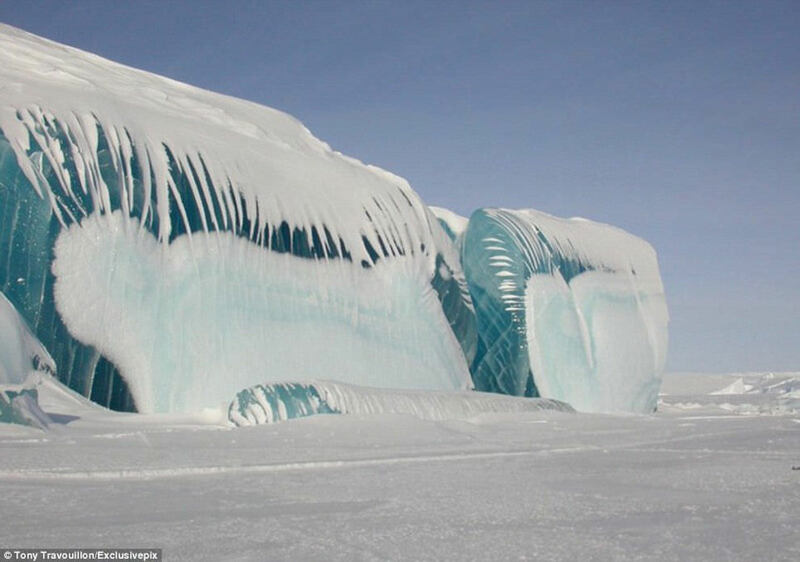 Often incorrectly attributed to waves freezing instantly upon contact with the Antarctic cold, this beautiful ice formation is actually the result of glaciation, which compacts the ice and lifts it upwards. Over the years, the elements erode the ice, giving it its unique wave-like shape. 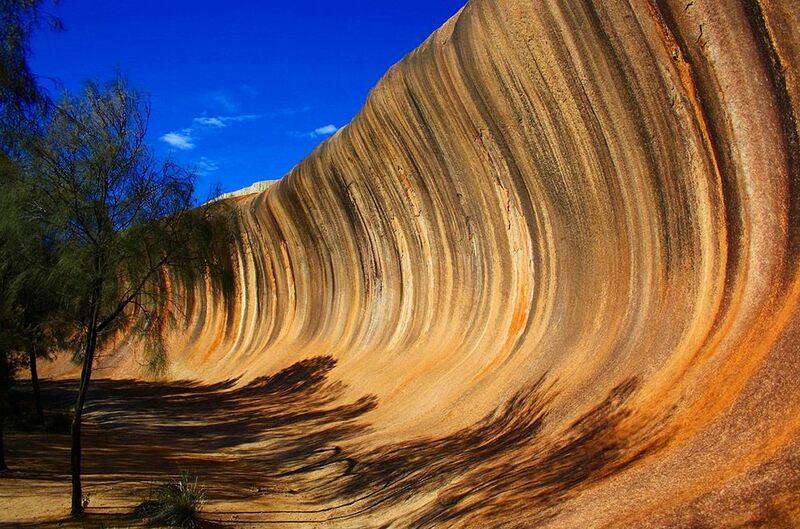 So there you have it – 53 more surreal places in the world. 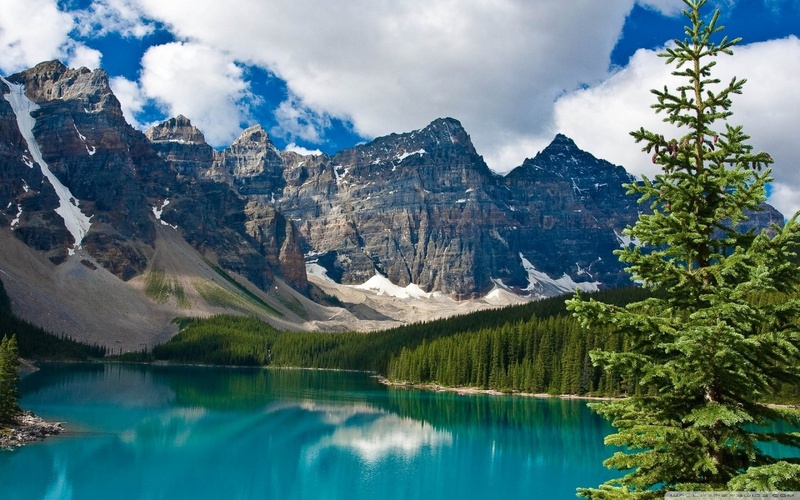 How many of these are on your travel wish list already?